HEROIC 1953 PIONEER TIMBER SLIDES…. 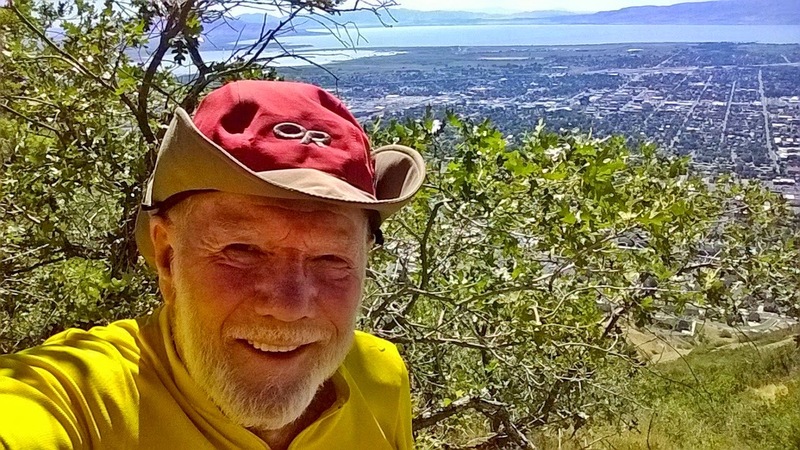 INTRODUCTION: While I’ve had to hunker down close to Utah Valley for most of the 2014 summer due to several emergencies–and forced to suspend the backpacking aspect of my High Uintas Wilderness Project until the summer of 2015 –in my 80th year, I’ve kept in shape focusing on mountains nearby–The Wasatch, where the pioneer founders did incredibly heroic things some of which few if any know anything about–even in Provo & Springville, Utah. 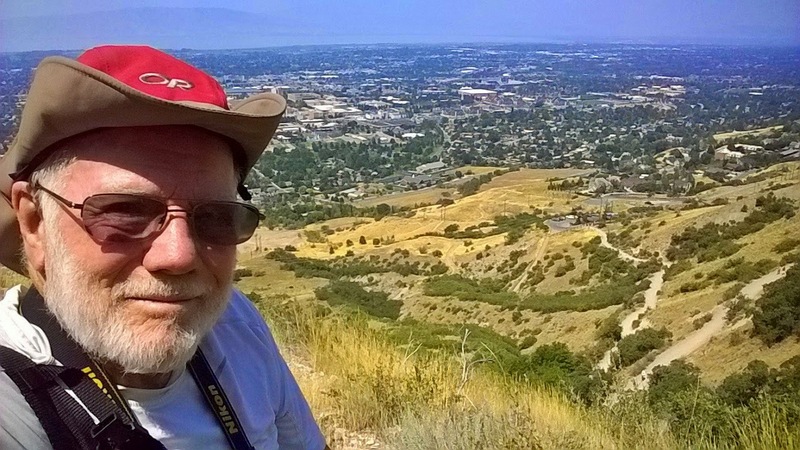 Read on about my research and original exploration–abundantly photographed, that I guarantee will fascinate and help you appreciate what a bunch of tough guys did to make possible what we all enjoy today here along the Wasatch Front. NOTE: Concerning the interesting history of Utah Valley I will draw some on one of my previous posts inserted here and there in this photo/essay, but believe me we’ll get into new territory and discoveries never published before. monument found in Pioneer Park, 5th West and 5th North in Provo. In 1847, when the pioneers led by Brigham Young came into the Wasatch Front, there was some consideration given to settle in Utah Valley. The area had been visited in 1776 by Fathers Escalante and Domingues who had established in their short visit a good relationship with the Timpanogos-Ute Indians. The Utes of Colorado called them, “THE FISH EATERS,” due to much of their diet coming from the abundant fish (“speckled trout,” and suckers) from the clear waters of the streams flowing from the mountains, and the then clear water of Utah Lake. and in a letter to the King of Spain, said, it was…. The priests promised the Indians they would return and establish here a Catholic Mission. Can you imagine how different the history of Utah would have been if they had of done so? 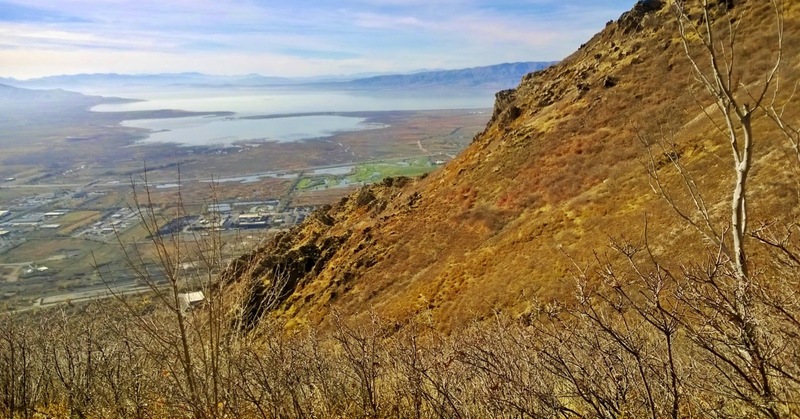 Brigham Young had several reasons to choose the Salt Lake Valley as “THIS IS THE PLACE,” a practical one being it would be just a little simpler during the first years of survival as there were basically no Indians there they would have to contend with. There were in Utah Valley–the Timpanogos-Utes. The same for north of the Salt Lake Valley up into southern Idaho, also under consideration, but there the warlike Shoshone Indians dominated. The Indians were upset with the settlers for killing wild game, leaving less for them, and they retaliated by stealing cattle and horses. 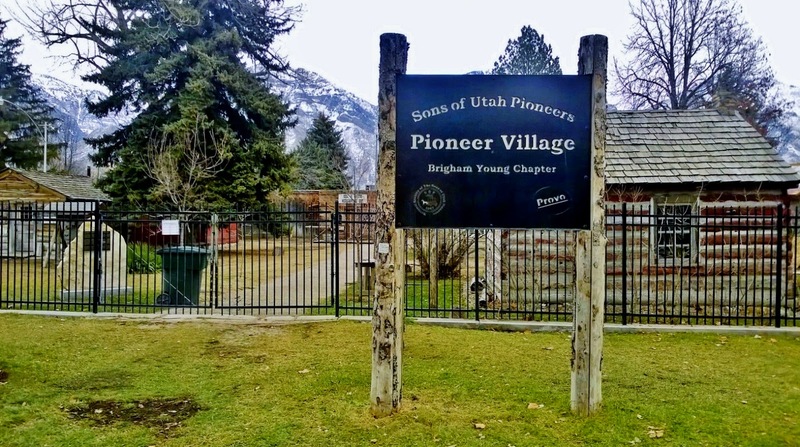 Eventually the conflicts “…culminated in the largest Indian battle fought within the present boundaries of Utah,” on February 9-10, 1850, called, “The Battle of Provo River,” that occurred approximately between the Deseret Industries store and shopping center to the east of north Provo. We can see in the first picture above, an artist’s depiction of Fort Utah, a wagon loaded with logs from which the fort was built, they needed timber products–for construction and fuel. Then we see in the picture above a large log cabin that served as the school, meeting house, and what we today would call a “cultural hall,” and see the pioneers needed lots of timber. …. and reading on I found a simple notation on the second page……. Here we see it separated. 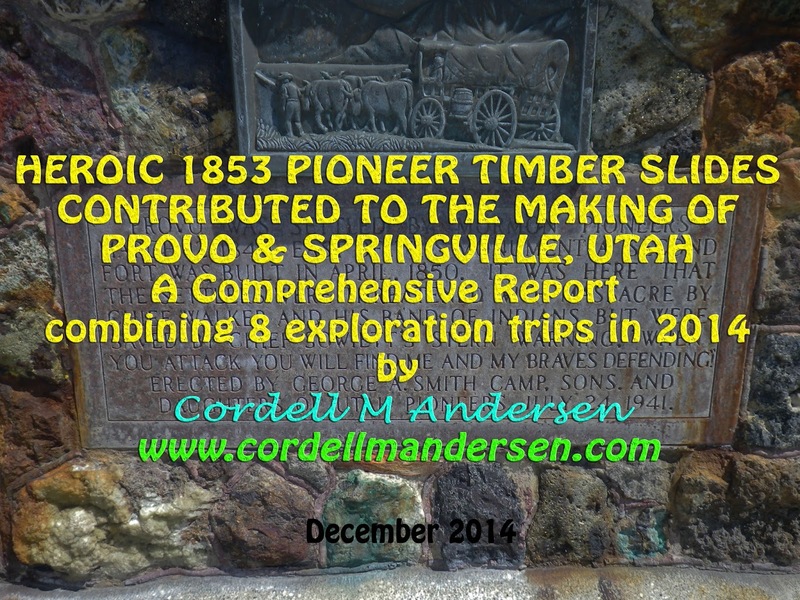 Thus was born the subject, “PIONEER TIMBER SLIDES” and I became determined to find evidence of them, hopefully find remnants, artifacts, and make a photographic record to share as I felt it would be of interest to many, and inspiring to all of us. 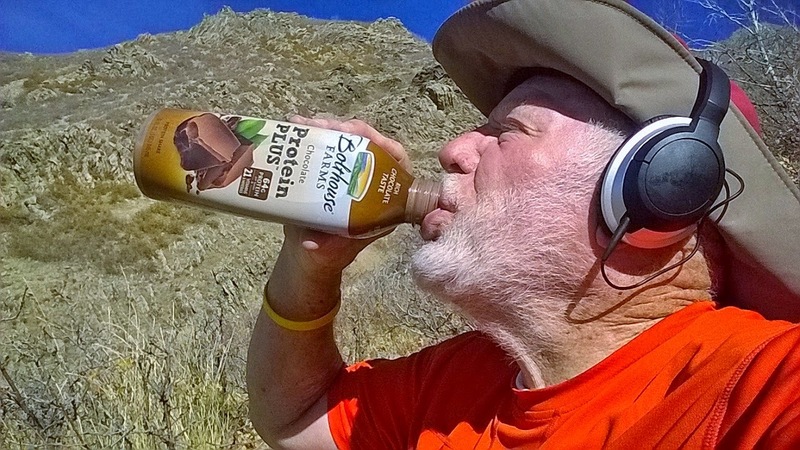 Also of great interest to me in “my golden years” was to get some great exercise and keep my body alive and strong, to persist with the backpacking aspect of my HIGH UINTAS WILDERNESS PROJECT in the summer of 2015– in my 80th year. 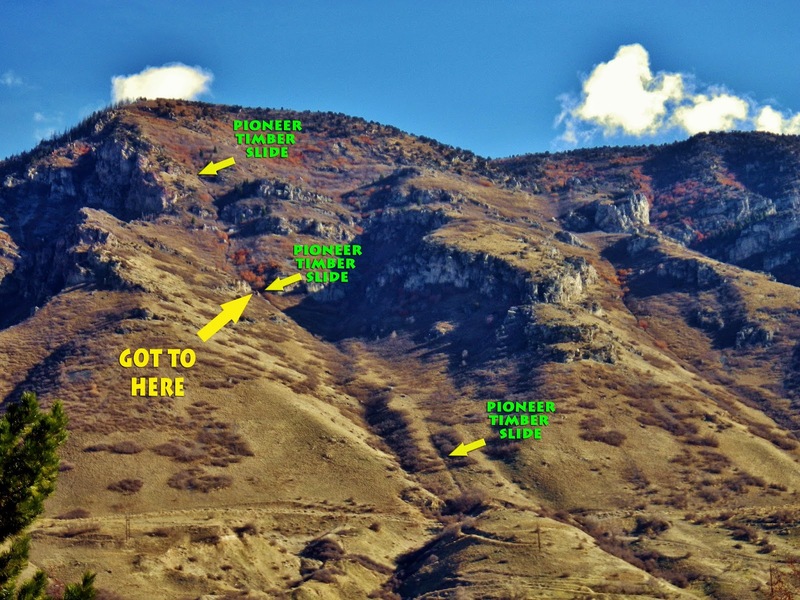 So I began scanning the mountains east of Provo and Springville….and wouldn’t you know it, I quickly came up with some leads…..that led me into the mountains you see below. From North Provo we look East at what would be the focal point of my efforts–Y-Mountain, Slide Canyon, Maple Mountain, Maple Flats, and the little knobby hill to its west overlooking the valley–a little crest that the pioneers seemed to call, “Slide Mountain,” and then further south towards Springville, Buckley Mountain. 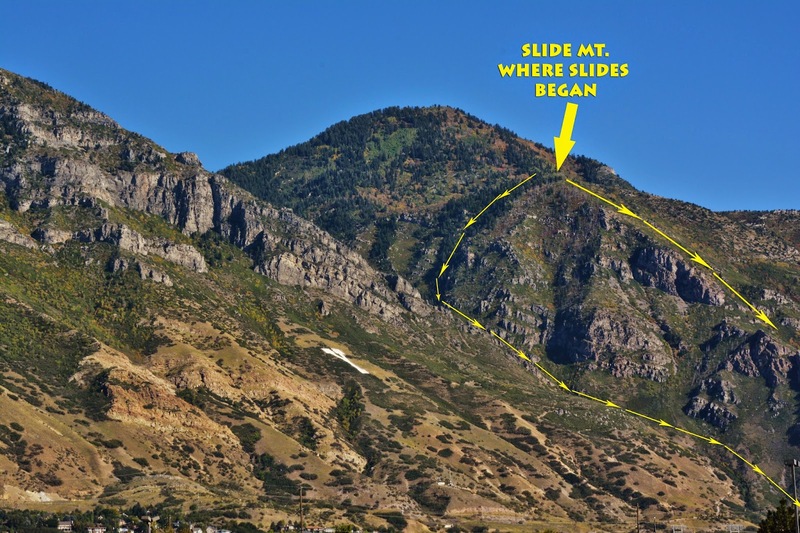 “Workmen finished the timber slide down Slide Mountain in November. 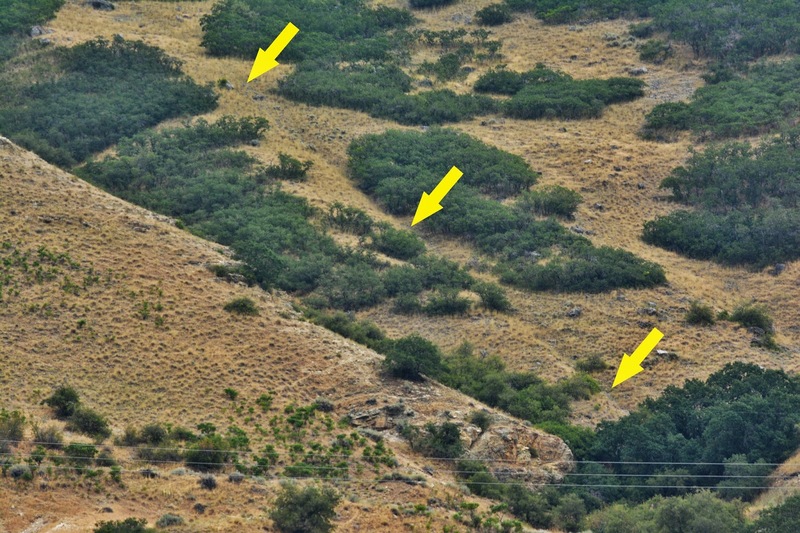 George A. Smith informed the editor of the Deseret News that the two-mile-long timber slide ran from the top of the mountain to the foothills below. ” It was described as a “chute” “.. consisted[ing] of small logs on the bottom and large logs on each side, making a sort of trough” p. 133. The above quotes led me to understand that it would be possible to find logs, planks, and support structures for the “chute,” along with square nails to hold it all together, such as I discovered in exploring and discovering remnants of the flumes used by the tie hackers to get their wood products out of the Uintas and down into Wyoming. It all begin in mid-July and continued until early November for a total of 8-9 hikes, some of which have been reported on, but this photo/essay will combine into one report all the hikes from mid-summer, into the colorful Fall, and end with the drabness of early winter. So as we proceed you will see views of all three seasons assembled into one report. This is the sign just below the Y Trailhead….which is what I should have taken a picture of, but we see above the rocky crest in the middle-right of the photo is Slide Mountain, also see below from the trail’s beginning up from the Parking lot. 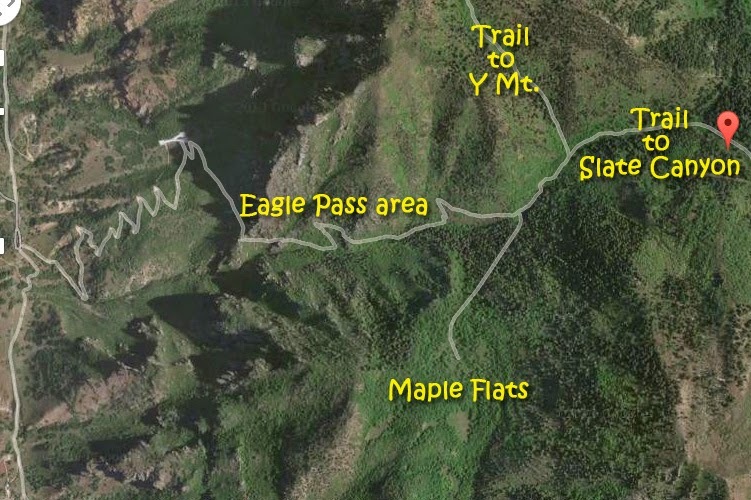 It is the trail t the Y, but the Forest Service designates it as the “Slide…Slade Cnyon Trail,” as it continues past the Y, up through Eagle Pass to the “First Meadow,” where a trail separates to the south going to Maple Flats, the main trail going on to Y-Mountain, etc. There was a problem, leaving late it, became a struggle going up the trail as it was a swelteringly hot 104 degress F. This mother and daughter coming down were suffering and not in a good mood, and I was overheating myself and having great difficulty, especially with a pack on my back as I intended to make it an overnight stay. A friend seeing this shot in a previous report….accused me of focusing to much on the young ladies…..but believe me I was so delirious by that time I only noticed the SUN FLOWERS….that screamed at me…..!!! Those drops of moisture on the stem….were from the sweat pouring off my face! So I dutifully turned around and headed for the safety of my air conditioned car! 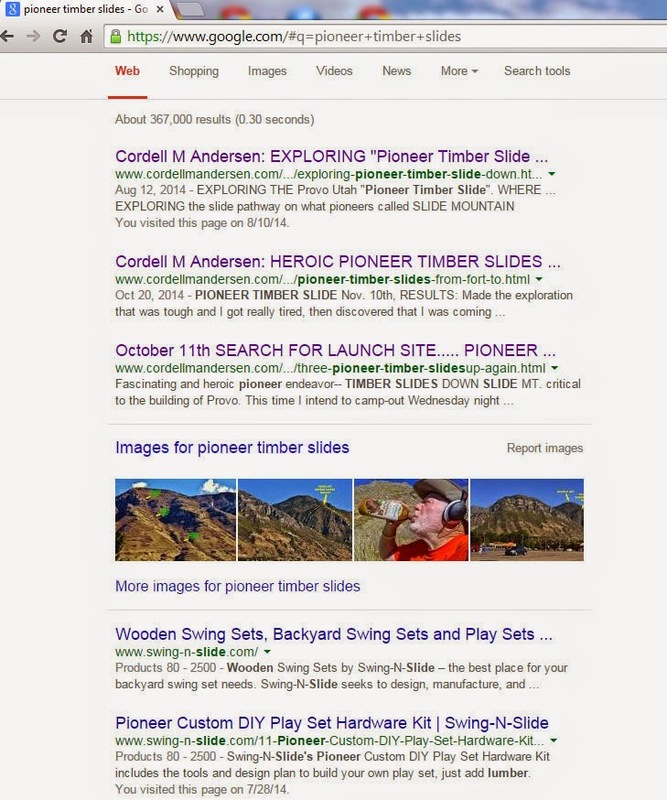 You might say …..but a quick Googling of “Pioneer timber slides” shows that I didn’t give up, but rather became the “expert,” or maybe “the only person in the world who cares about timber slides!! !” BUT KEEP SCROLLING…YOU WON’T BE SORRY! Of course you will also notice that, along with me, the only other entries in the search concern CHILDREN’S PLAY APPARATUSES….. So, a day or so later I was again starting up the mountain early. IT WAS 43 DEGREES COOLER! What a wonderful hike up the Y-trail along with tons of happy people. The pictures tell the story. Young and old, many families having a wonderful hike. And seeing views of Utah Valley! What a wonderful background for a family picture! Eventually I got a call from the son of Dr. Kartchner who brought my first 4 children into the world….way back when the total pre-birth, birth, and post-birth bill was around $300 for each! 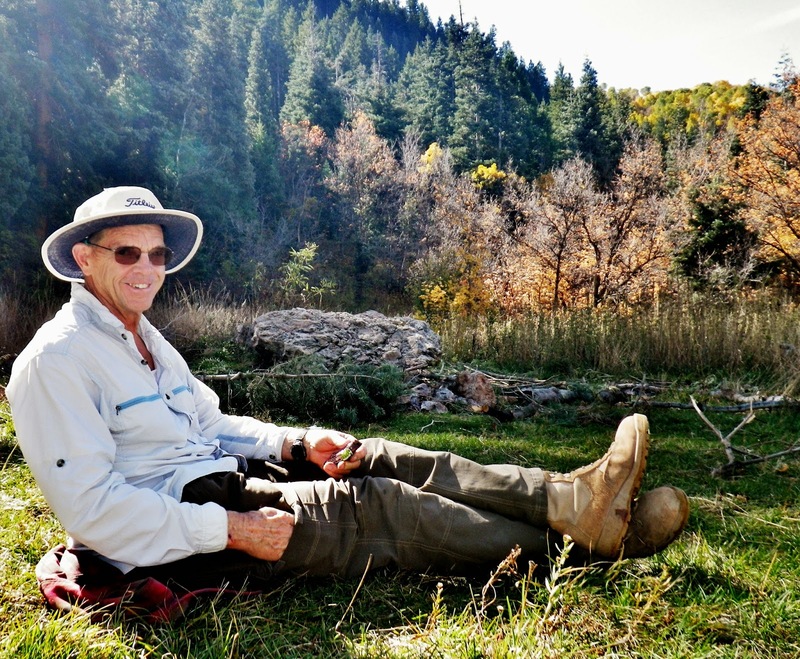 Ken wanted to talk to me about my nearly half a century of experience living and working among the Mayans in Guatemala….so Ken Kartchner became my hiking companion on one key hike. These beautiful sisters also were hiking companions on one hike….smiles that will brighten anyone;s struggle up the mountain. 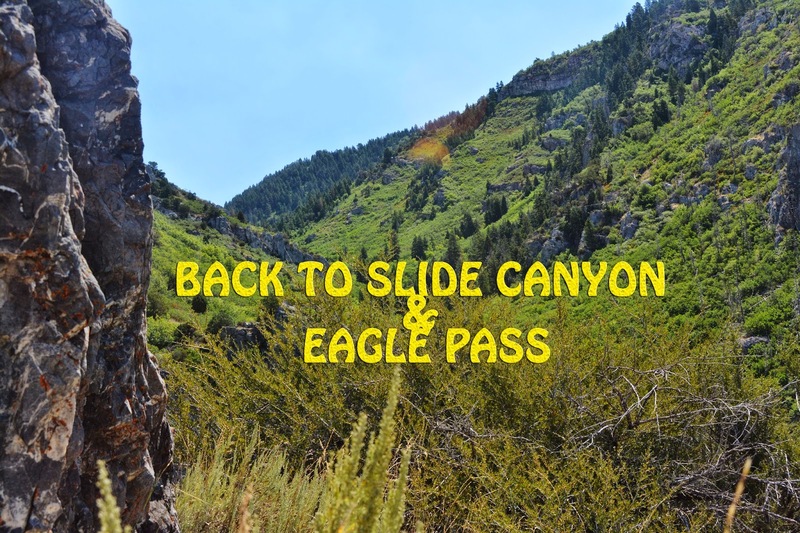 My objective was to go way up above the Y through Eagle Pass, observing the pioneer timber slide coming down Slide Canyon, then on to Maple Flats and locate the launching site for the slide down the front of Slide Mountain. Here we head up the trail from the Y towards Eagle Pass….as you can see this was late Fall after most of the leaves had dropped. The high crest in the background is Slide Mountain. Up there is where the launch site was for both the slide down the Canyon, and down the front of the mountain. 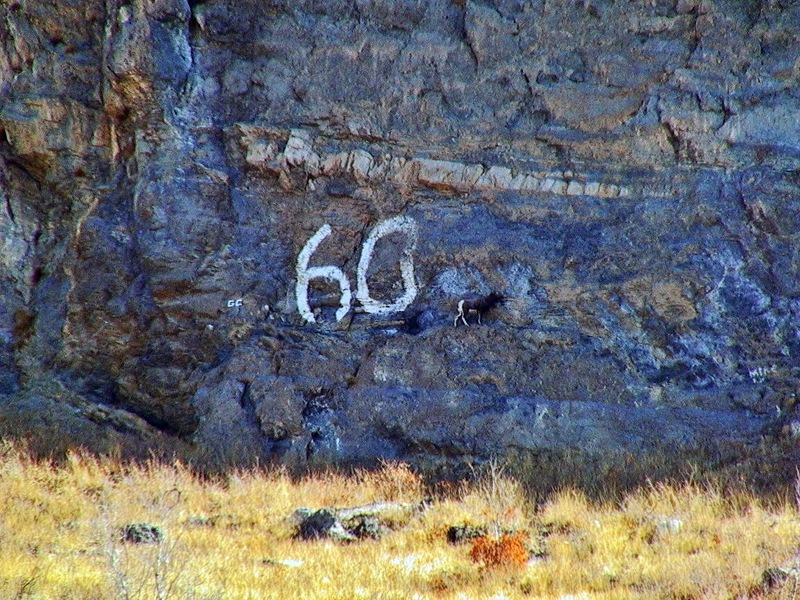 Looking up towards Y Mountain where apparently the Class of ’60 marred the mountain, we see an animal up on a ledge. 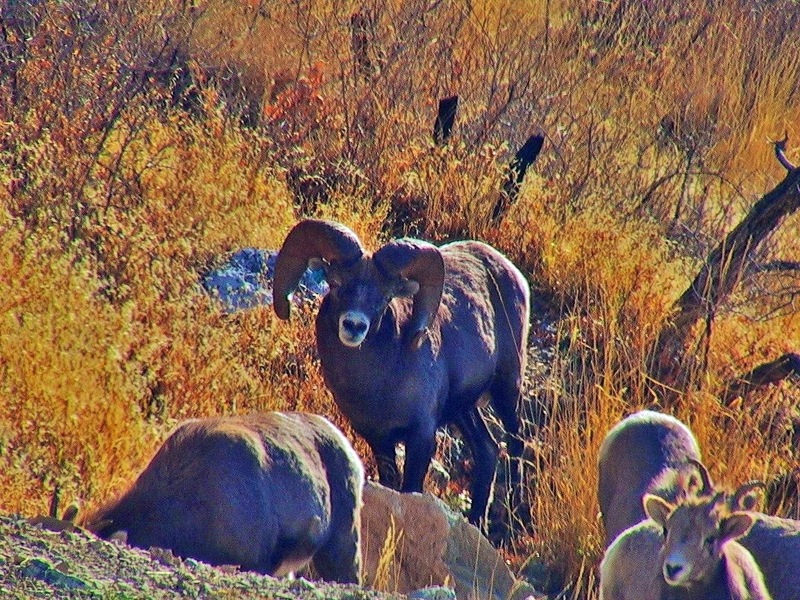 Soon we see others, and get quite close to Rocky Mountain Sheep, one we see below that would be a trophy. UTAH POLYNESIAN MISSION in Utah Valley. We are nearing Eagle Pass, with Slide Mountain below the moon, illuminated by the setting sun on one hike. At Eagle Pass we look back over the Y towards North Provo. From a different angle we see Mt. Timpanogos in the background. Looking down towards the West we see a pathway leading down to the foothills….it being the Slide Canyon Pioneer timber slide pathway….we will now explore more closely. 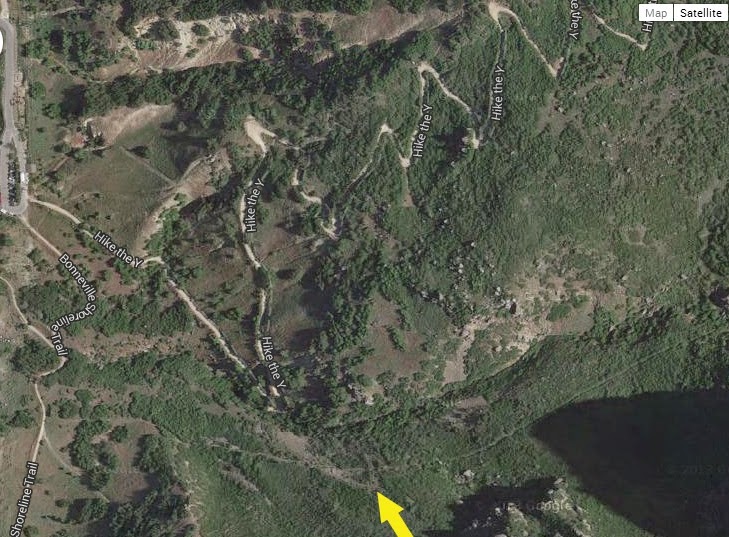 Google Earth, helps us get the bird’s-eye view of Slide Canyon slide down to the foothill road on the left, with the Y-Trail in view to the north. From the foothills road we look up the canyon with the slide cutting across the picture angling up, and below zoom in some on the pathway seeing in almost dead center a curious half-moon like area cleared above the pathway. Below the half-moon cleared area is pointed at with the arrow. 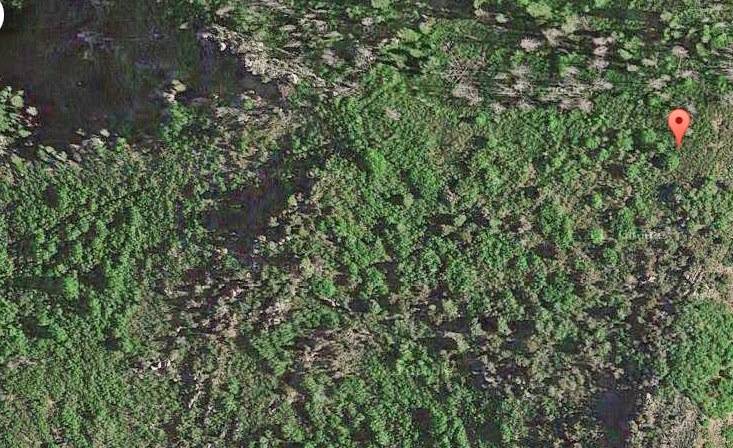 On Google Earth it all looks flat, but the cleared area is very steep as seen above enlarged. Now we will get down on the ground and hike up the pathway to see what we find. 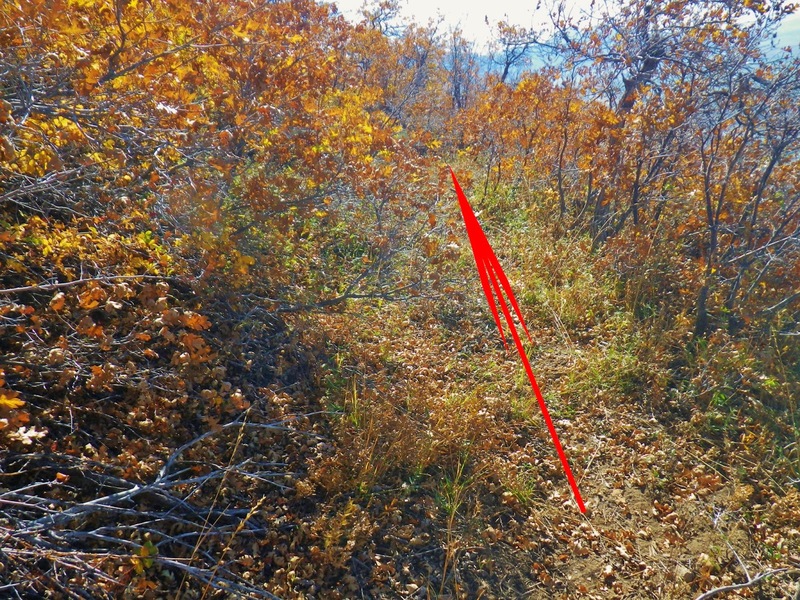 The red mark is a SPOT Track indicating where the first photo was taken as seen below. We proceed up the pathway and see where a little excavating was done . Here from the previous shot up, we look down towards Provo. We pick up a trail, crossed by the pathway. From a little higher, where the pathway coincides with a rock slide, we look north at the Y-Trail. Portions of the pathway widen as you see here. No artifacts of any kind have been found so far. Below we again look down towards Provo. At the lower portion of the cleared half-moon area we take a SPOT Track with its icon noted below. From this spot we get a good view of the Y-Trail and many hikers. The pathway continues straight ahead in the photo. The cleared area rises to our right and pointed out in the photo below. We can’t decipher what its purpose might have been. From this point we look up towards the Eagle Pass area where in a moment we will see the pathway as it comes down the steep canyon. From this point I will head up to the top of the ridge to the south, looking back on the pathway as seen below. 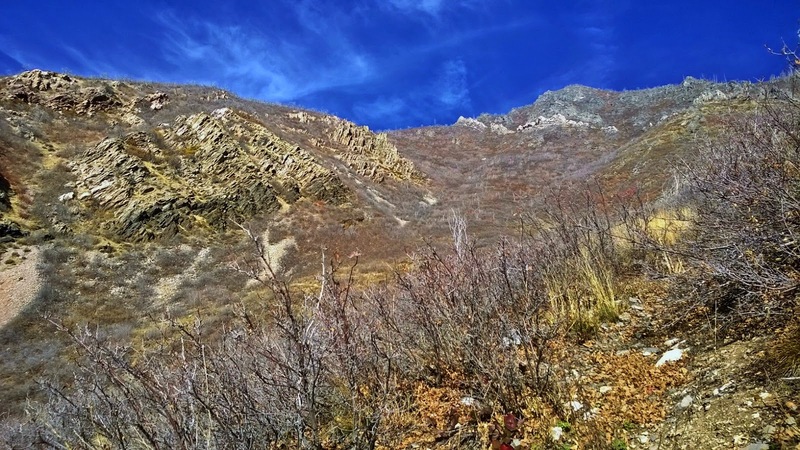 We come over the ridge and drop down to the foothill road and Bonneville Shoreline Trail, on our way to explore the lower portion of the timber slide that comes down the face of the mountain. Along the way we find some old wood, hoping that it might have something to do with the timber slides, but as we see, the nails in it are round nails invented in 1910. Nails from the timber slide period would be square nails. So this is nothing of importance in our search. 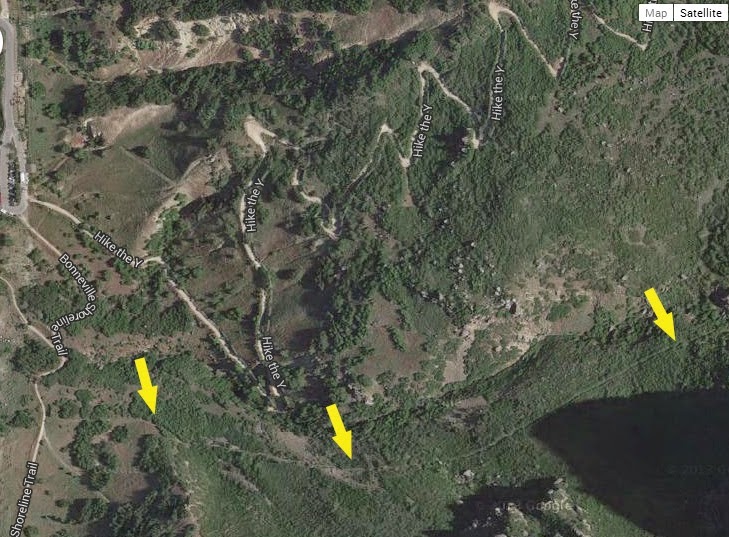 At about the point where we come to a hefty gate barrier, is the approximate area where the timber slide would have come down to the foothill road, and so we look up to see what is visible. 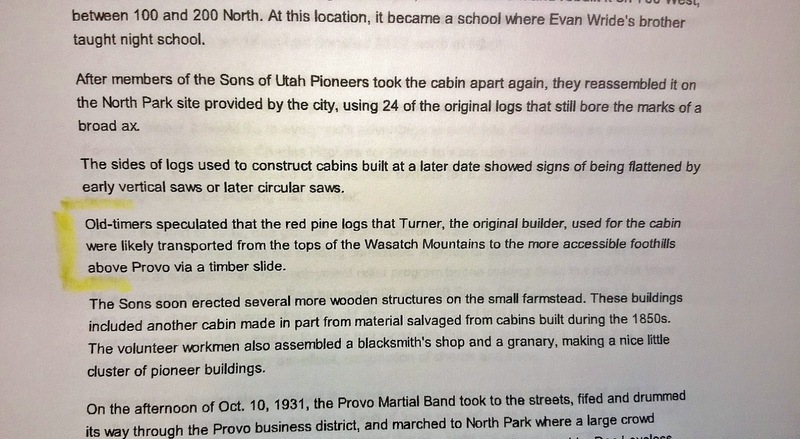 Once again, we quote from Carters book, FOUNDING FORT UTAH. 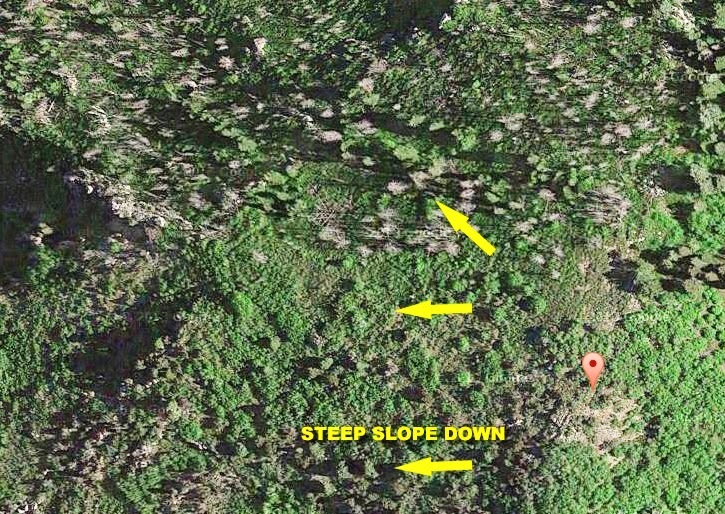 Above Google Earth helps us again showing the portion of the slide we will explore, indicated by the arrows. From the point of the SPOT icon, we look up and really can’t quite see anything, so we move a bit north to look at it from a different angle, and it pops out at us, shown by the arrows. 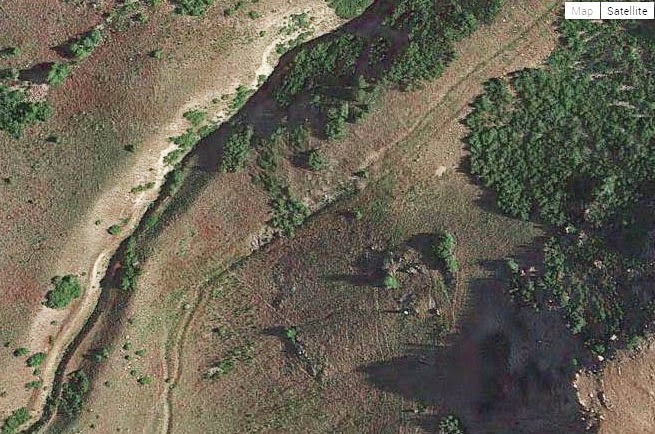 Again, this is likely the area described as having been dug out to form a sort of ditch. We begin the struggle up the steep slope, with this shot of the adjacent ridge showing us the angle of steepness. It wasn’t an easy climb! Here we are looking down the area where accounts describe a ditch being dug. Later when I come all the way down from the top, I’ll show pictures that show it a little better. Looking at the ridge to the north…..do you see it? It is not a white spec of lint on my lens, nor on your computer monitor. Let’s zoom in and see what. Sure enough, I didn’t have to clean my lens. It’s a hang glider. These guys haul their gear all the way to the top of Y-Mountain and launch themselves out over the valley. Some of my reports on the timber slides have been entitled WHERE EAGLES DARE (the title of a Clint Eastwood movie), and wouldn’t you know it, AN EAGLE SAILS INTO THE PICTURE and I clicked off a shot! Below we say “farewell” to the hang glider, and come back to Slide Mountain. We are approaching the NARROWS. Lots of VISIONS OF NATURE all around. …..and coming down coinciding with the ravine. The view looking down the pathway towards Provo. 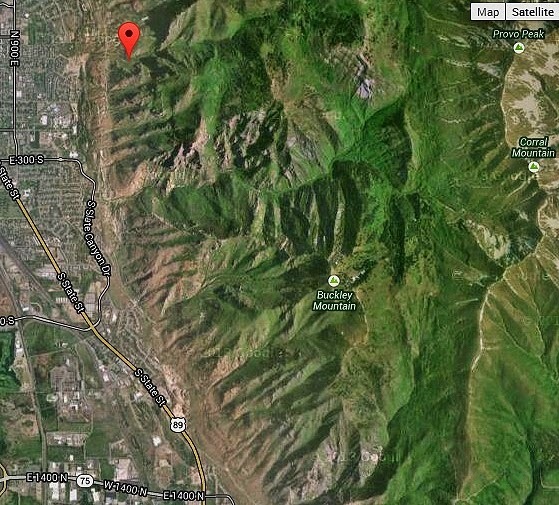 It had been a late start and this was enough exercise for the day….still no arifacts, just beautiful views of Provo. Still even had some ice left….a cold drink very welcome. …..so with a parting VISION OF NATURE I had off on another exploration…. Fall and Winter must be coming as this Rock Squirrel is loading up on acorns and other good stuff. Before heading back to Eagle Pass, let’s go a little further south to take a quick look at what was the first TIMBER SLIDE. 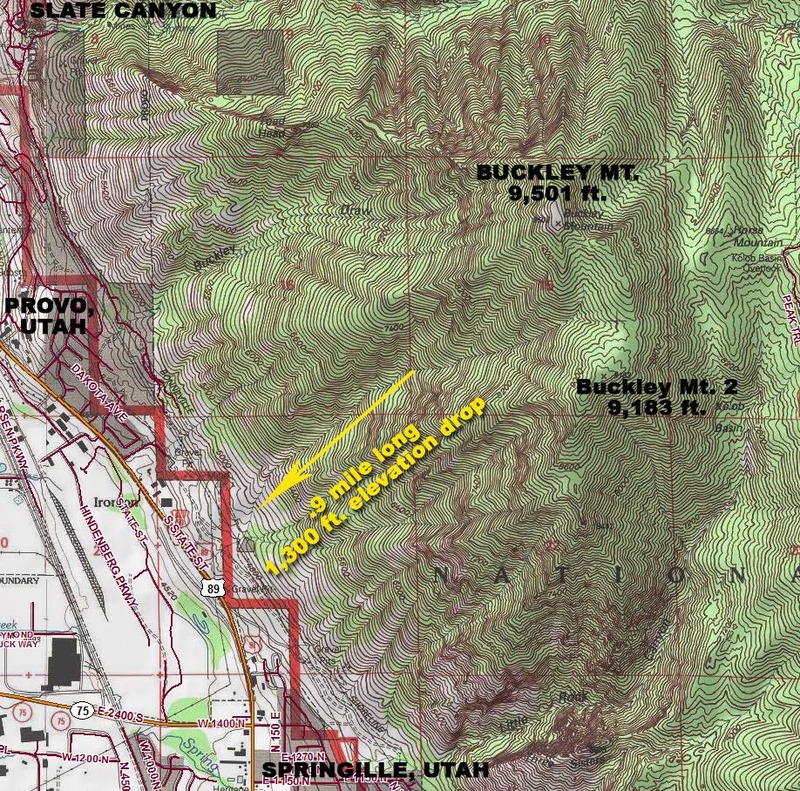 This permission was granted first, for the area known as Buckley Mountain that has two peaks, with a ravine separating the higher on the north from the lower on the south. 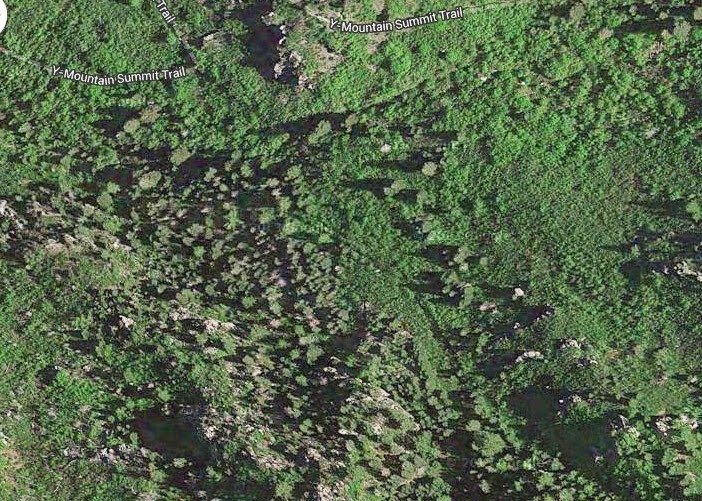 So via Google Earth we fly south to Buckley Mountain. These are the two Buckley Peaks, the highest on the left, the ravine coming down between them. Now let’s zoom in and see what we find. 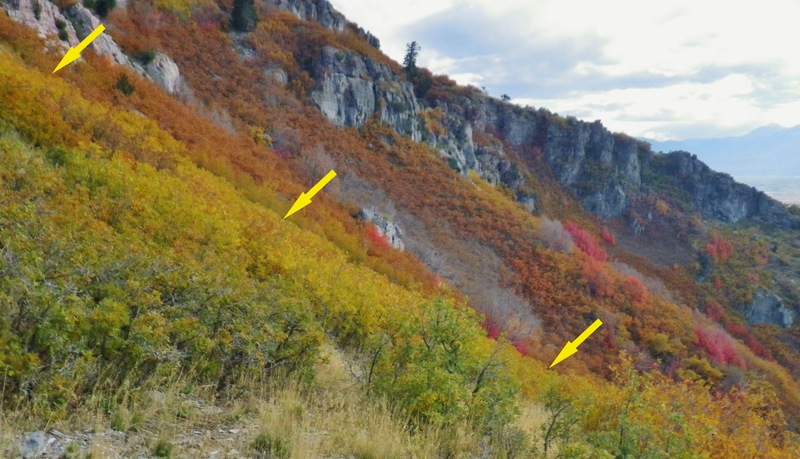 Above we see a Fall-Winter view, and below early Fall, very obviously showing a pathway coming down to the foothills. I insert the picture below to orient you where this is. We are seeing the “Old Highway” 89 between Provo and Springville, with the Public Works Vehicle facility on right, and the rock quarry in the middle. 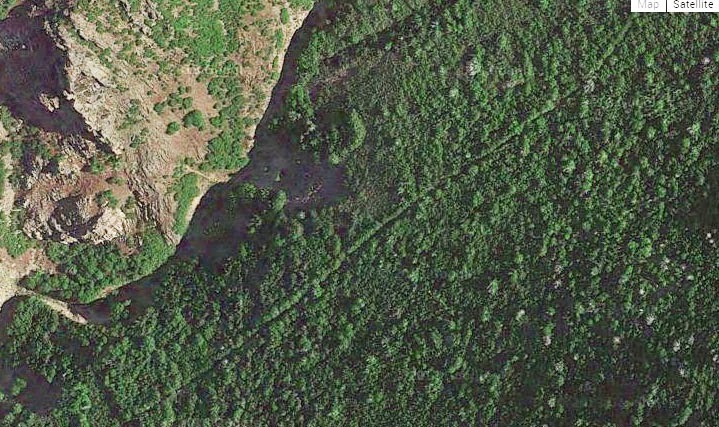 Below, from Google Earth we look down on the lower end. It then goes up the mountain. After a grassy area it get’s in to the scrub or Gambles Oak and Maples. It ends at the base of some cliffs. 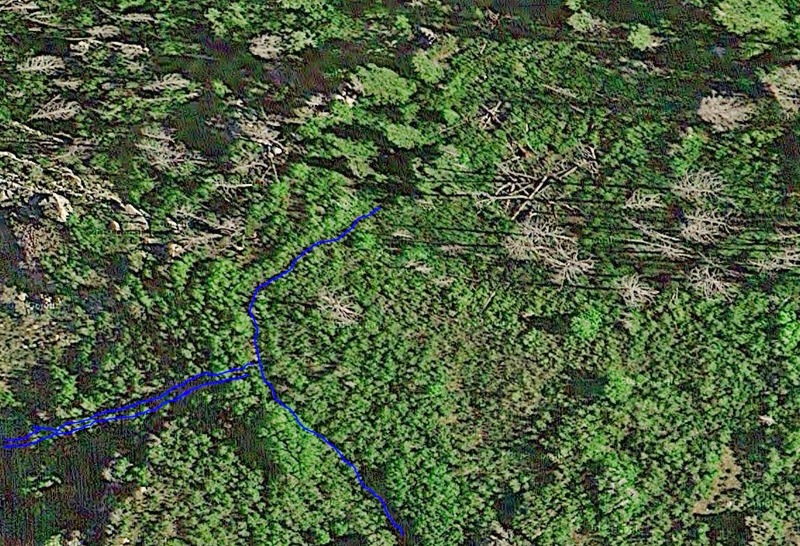 The SPOT icon is where I got to, and sadly didn’t continue as I got really tired and didn’t feel well and headed back down–I actually had the SHINGLES coming on from the day before without realizing it--making it necessary next year going back up there as one can see in the Google Earth view that there are some other pathways off to the side, and something in the shadows at the base of the cliffs. 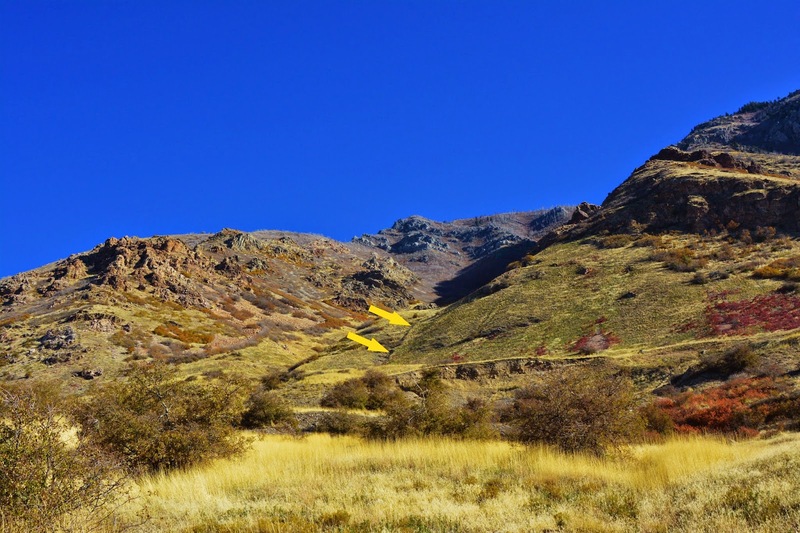 As I approach the area, I see the steep pathway coming down to the hills, marked by arrows. Approaching the climb up the hill. Then comes a relatively flat area covered mostly with grass–the pathway not really visible. Soon it appears going through thick scrub oak. The deep leaves make it quite impossible to find artifacts, like square nails, except in clear areas, where I found nothing. This is where I got to….and started feeling pretty cruddy to say the least….got some nourishment–kindly given to me by my son Lito’s (Cordel Ammon) father-in-law, Edgar Pacay, visiting them from Guatemala up in Worland, Wyoming a few days before, and headed down the hill. Lots of VISIONS OF NATURE all around! The view from the turn-around point–or the “throw in the towel” point, with Ironton and such down in the Valley below. One can see that this timber slide wasn’t very long…about a mile. It doesn’t get up high where the timber is….unless the pioneers cleared it all out, dragging it down to the cliffs with oxen, or mules, in which case there would be stumps up above. Have to check that out next Spring. 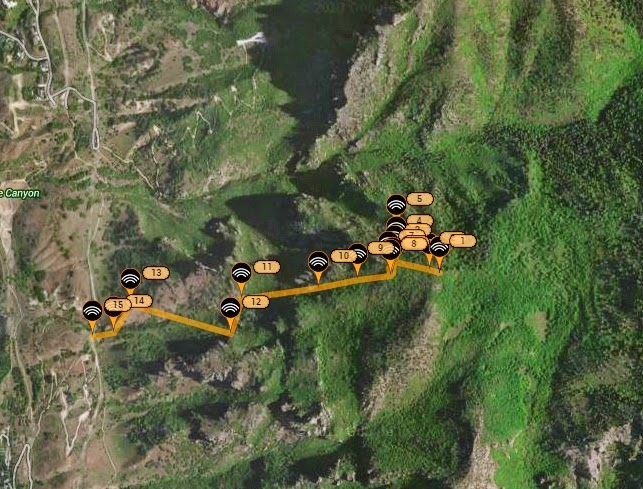 Now, up through what I call, the Eagle Pass area, as there are like 3 passages before getting to the first meadow. We will first, as we work up the trail, look down into the ravine for signs of the timber slide pathway that came down Slide Canyon. Below we see the trail as we work to the first passageway. Down in the ravine we see clearly the very steep pathway up out of the gully. 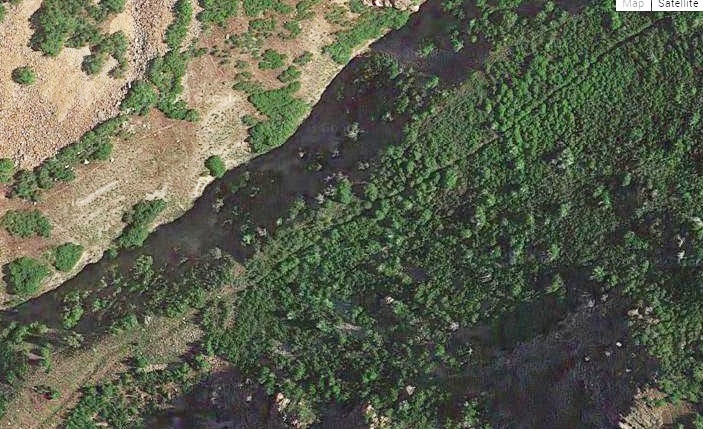 Further along we still see the pathway paralleling the ravine up the canyon. We leave behind us the first passageway, with the valley far below. We look up to what I call the second passageway of Eagle Pass. It then plunged down the steep canyon, just up out of the ravine. I still can’t quite imagine how they could have actually built a “… slide consisted[ing] of small logs on the bottom and large logs on each side, making a sort of trough” down through these areas. It wouldn’t have been possible either for a log to come down the “chute” and make a sharp turn without jumping out of the chute or slide. The description previously cited, saying, “Large logs as well as small ans [ones] would run with great rapidity….We would often start timbers at the top end of the slide an[d] it would run the entire [way to the] loading place with out a stop.” That description seems more likely to refer to the slide on the face of Slide Mountain, and not this one in Slide Canyon. However, once down to the ravine, the logs could maybe make a run to the bottom with stopping.……. still lots of questions,. Below we also see that a trail, or pathway continues up the ravine, but it is not visible on Google Earth a couple of pictures below. A couple of pictures below the same area is seen with the oncoming of the Fall, showing pine trees growing right out of the middle of the pathway. Saying “old timers” called them “red pine logs.” but “red pine” trees are not found in Utah, but from Newfoundland west to Manitoba and south to Pennsylvania and in Virginia, West Virginia, and a few in New Jersey and Illinois. The pioneers apparently were referring to our Engleman & blue spruce and Douglas fir we see here in Slide Canyon. 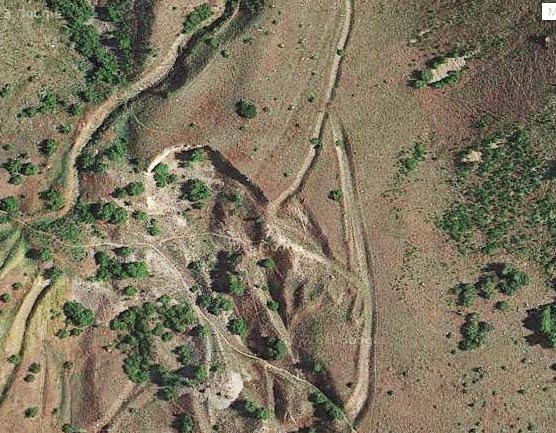 Nonetheless one might say that it is just the ravine the water drainage created, but a Google Earth view below seems to make it clear that man has his hand in it. 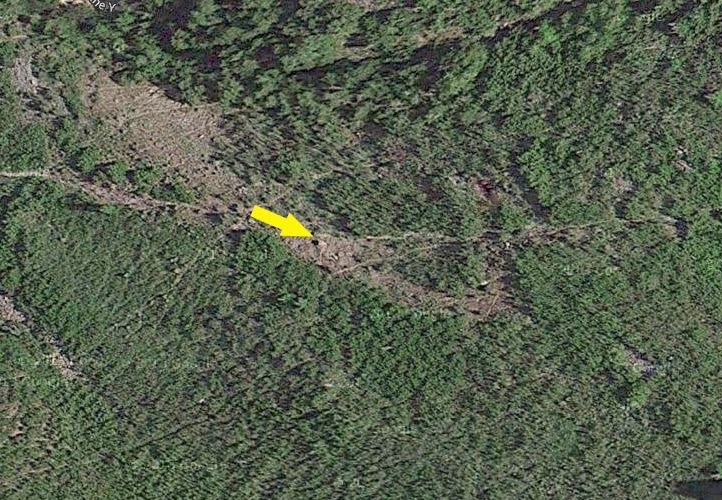 Google Earth shows a pathway coming down out of the pines, but which divides, the lesser going straight down to the ravine trail, the other curving to the left perhaps with a curve sufficiently large enough to keep the timber from jumping out of the chute. 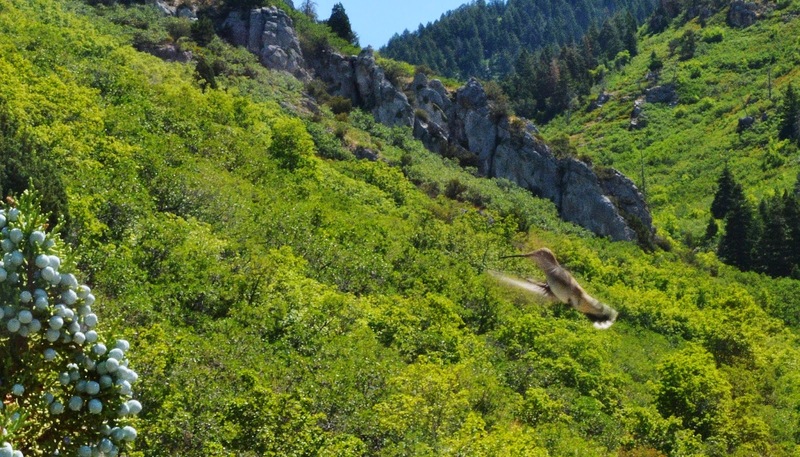 We continue up the trail leaving Utah Valley behind us……and notice that we are being spied upon by one of the local beasts! The “beast” is another Rock Squirrel. and below starkly contrasting visions coming out of the ground. You’ll have to forgive me for reminiscing as I go up the trail….but these wonderful mountains gave me and my loved ones precious and unforgettable experiences that have enriched my life. 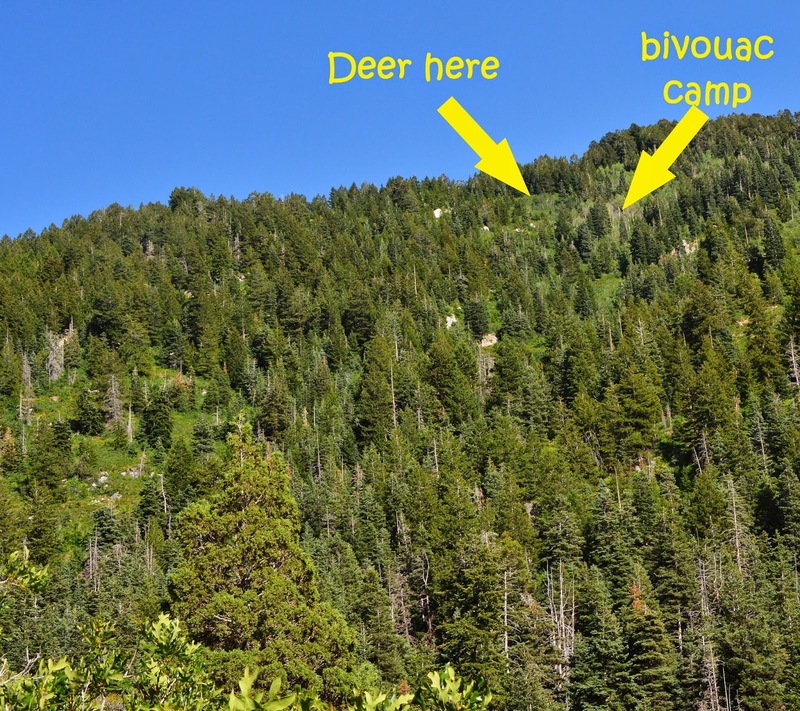 For example we see the ridge coming off of Maple Mountain where one deer season I bivouacked up there late Friday afternoon knowing that hunters would be coming up the canyon in the morning. Sure enough early the next morning I saw hunters coming up the Eagle Pass Trail, and a bit later the deer they were pushing came up the draw and stopped on the side-hill to look at me. Still in my sleeping bag, I rolled over and took aim on a big buck and dropped him. Then leisurely got dressed, packed up and went for him. I didn’t get a picture of him, but just for fun insert a shot of one from a hunt on the Henry Mountains back in “the good old days,” where I got him on the wrong side of the mountain, had to de-bone him, and with 150 pounds on my back, struggled up to the top and slid down the other side. More memories! One year I got up here late and in the dark laid my air mattress down on snow, snuggled into my sleeping bag and covered me with a poncho. During the night deer were stomping all around me and I thought I’d get stepped on, and wanted to see by the light of the moon what was surrounding me, but the crinkling of the frozen poncho stampeded them and so never saw anything. In the morning I was coming noisily across the front of Maple Mountain crunching through the frozen crust, when all of a sudden I saw a buck 25 yards ahead of me sort of spread eagled looking under branches to see what the heck was making so much noise. 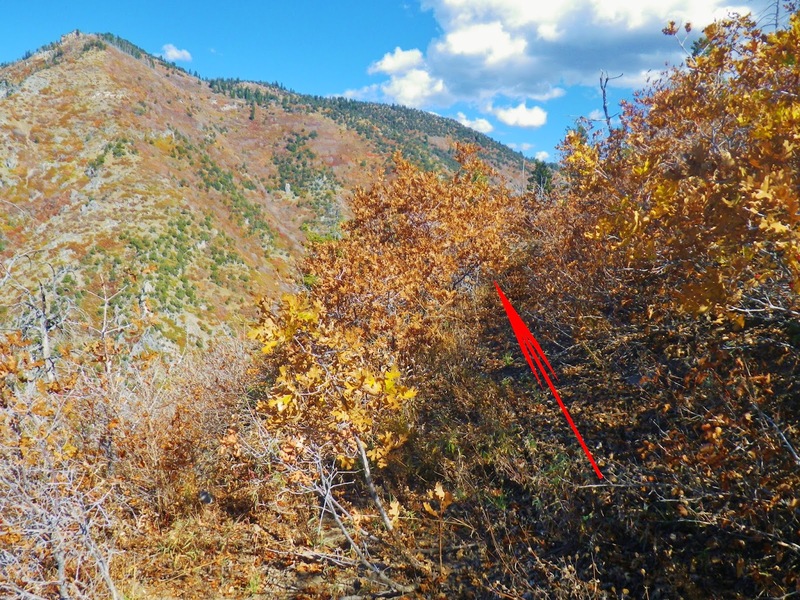 I dropped to my knee and soon I was dragging another buck down he Eagle Pass Trail and over the Y. 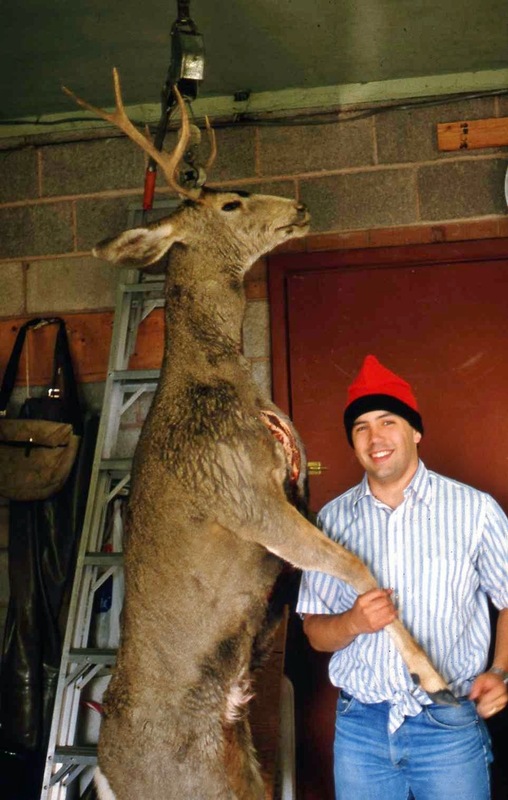 My son David, hearing of my success in this area, one year borrowed one of my rifles, and got his first buck, and a while later called me from the highest home on the Provo foothills asking for a ride home with his first buck. 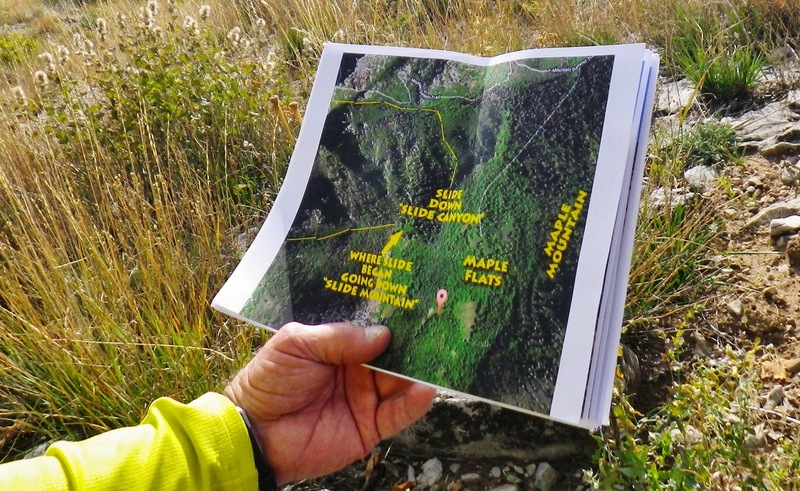 Well, let’s get back to our search…..Maple Flats is up there, and from there the objective was to find the launch site. Ken Kartchner resting up a bit before climbing up to Maple Flats. 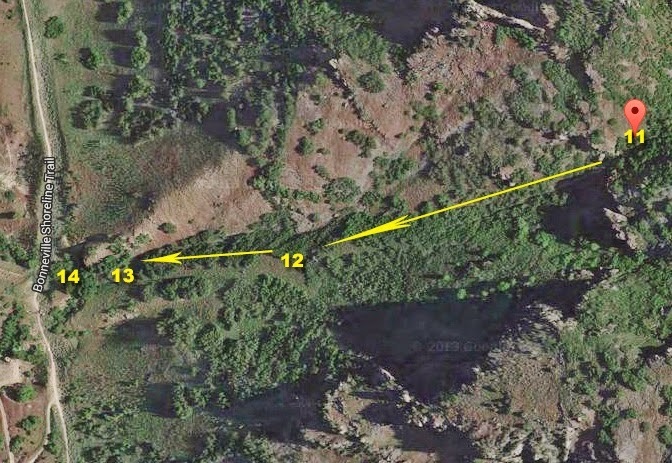 The trail takes off to the right of the large rock at the lower end of the first meadow. 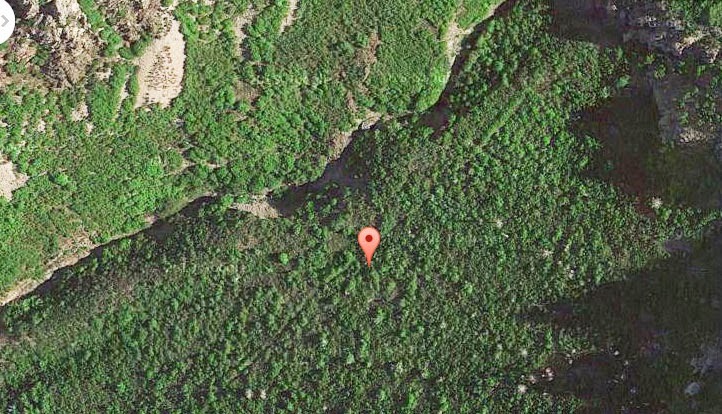 It angles up the hill to the southwest, and is not maintained by the Forest Service as you see below. The views are always wonderful, zooming down through the conifers at BYU. 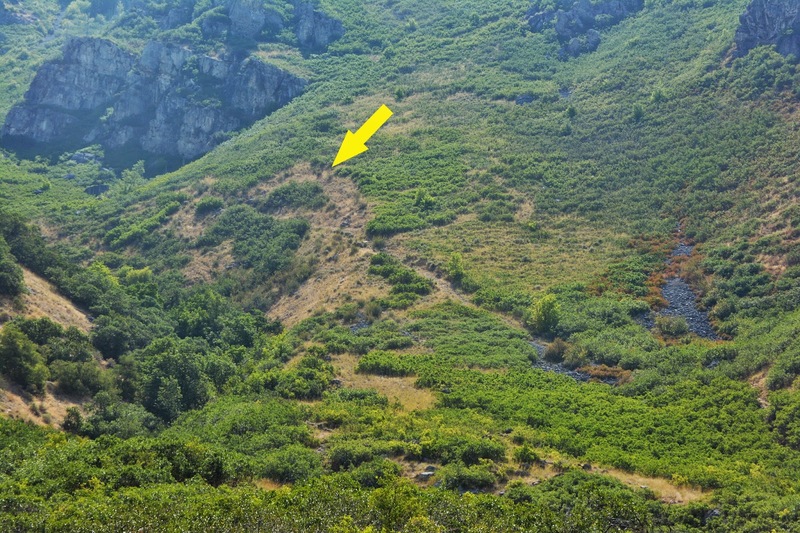 In mid summer the vegetation on this north facing slope was lush to say the least….the trail often times disappearing under the thick vegetation. The spring is about 3/4th of the way up to the Flats. If you can follow the trail and not get lost in the jungle of vegetation, you will come to the spring. As you can see it was just a very small flow, almost like a steady drip. On earlier trips before I got up this far I had ran out of water, and so started carrying as much as a gallon, and so never needed to use the spring. Later in the Fall, as indicated by the dry leaves below, there wasn’t even a slow drip. So, best not to count on this spring….and it is the only one on the mountain. Monk’s Hood is just one of the hundreds of varieties of wildflowers one can see from Spring until late Fall. 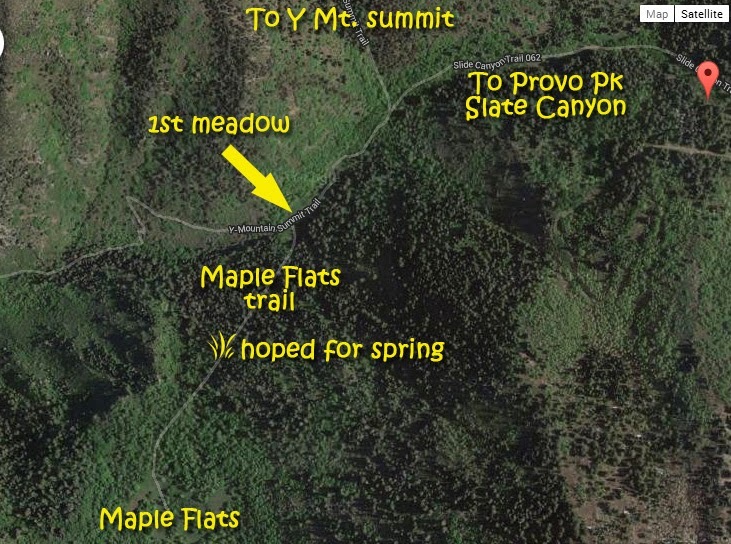 We are now coming to Maple Flats with what I call Maple Mountain rising up to the east. Look-out….more memories fill my mind….but first I see a spec of something up above the forest to the southeast. Believe me, it isn’t dirt on my lens, nor a spec of something on your monitor. Let’s zoom in an see what we are seeing. Sure enough we again are UP WHERE EAGLES DARE! A Golden Eagle. 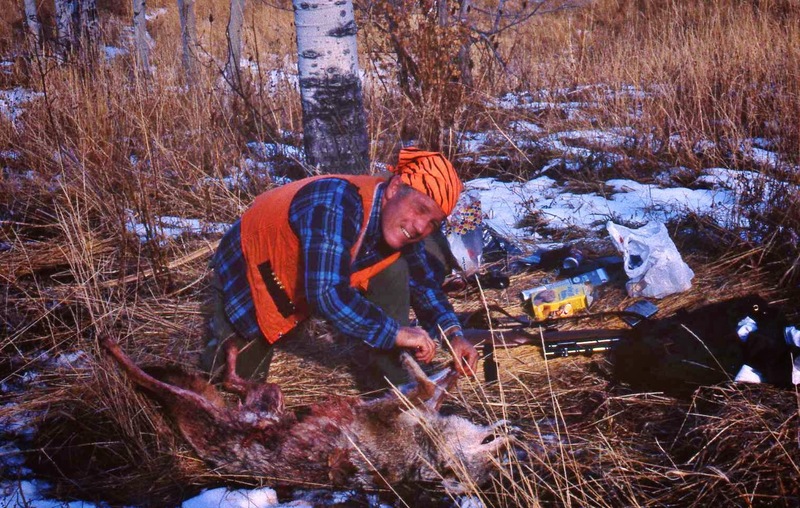 On my last trips in late Fall, Maple Flats, reminded me of my last deer hunt up here. The weather report was good, and there was to be a full moon, so I went prepared to sleep under the stars. There were patches of snow, but I easily made me a mattress of straw and snuggled into my sleeping bag. At about 10:30 I was startled by the reverberating, echoing sound off the mountain of a howling pack of coyotes that seemed to be surrounding me with Bose-like sound! I snapped to a sitting position, trying to sense exactly where they were. The trail was just 10 yards to the west. I grabbed my rifle, chambered a cartridge into my .243 rifle, laid it across my lap and laid back down…..waiting. A little while latter I heard the pack coming towards me on the trail. the moon was full and I could see pretty good. All of a sudden there they were single file heading south on the trail. I could see probably 10 of them, some in the middle obviously smaller, then came the big fellow last. I raised my rifle and swung it with the pack targeting the big one, and squeezed off a shot. I heard a yelp….and the pack scattered, but heard one struggling circling me towards the mountain and then there was silence. In the morning I got up dressed, and following a blood trail soon found my prize, drug him back to my little bivouac camp and began skinning him. David soon showed up and got a photograph or two for my memory bank. I had a taxidermist mount him for me, and soon he was with me on my way back to Guatemala to continue my work among the Mayans until 2002 when I brought him back to Utah where he adorned my living room wall in Springville until 2013, along with the antlers from my first buck that had also been with me in Guatemala for all those years. Now no room for either n my tiny Cabin A travel trailer, which is now my home, so things are getting spread around in the family….but the memories remain with me, always as will the adventurous experience of discovering and exploring the Pioneer timber slides.. In the northern portion of the Flats a principle vegetation was Stinging Nettle you see above. On my first trip, due to the hot weather, I went naturally in short pants, and a short sleeved T-shirt, so I all of a sudden was in big trouble. Believe me, this was no joke. I did what I could to persist, as you see below, opening up a couple of plastic bags and using my supply of black duct tape to protect my legs. I made it over to the souther part of the flats you see below, that are startlingly drier than the north, but my leg protectors didn’t work too good, and so I headed home, and came again a few days later better prepared. Looking south from Maple Flats where it drops off towards Slate Canyon. From Maple Flats, the exploration had to go towards the west climbing a small hill the crest of which I am calling Slide Mountain, because the pioneers used that terminology, as well as Slide Canyon. 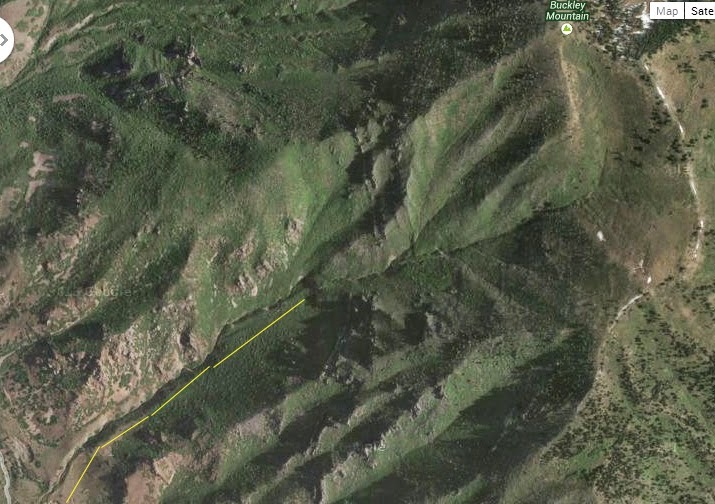 So we are dealing with two pioneer timber slides in this area, with a third on Buckley Mountain to the south. 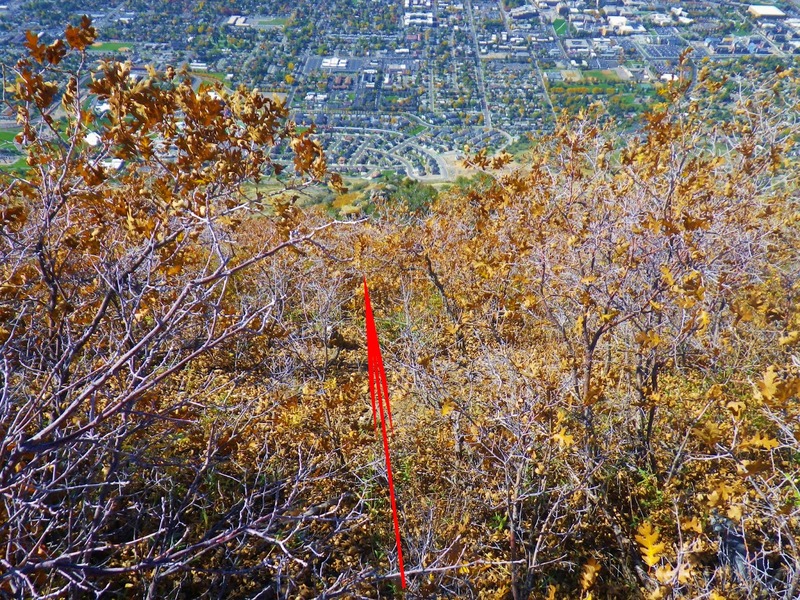 The red arrows show the path of my first explorations on Slide Mountain. as seen below. The Google Earth view we see here is terribly deceiving as it is flat, and gives no warning about the steep mountainsides I had to deal with….which wouldn’t have been too much trouble in my youth….but I guess I waited too long, now in my 79th year while doing all of this exploration. So off I go into dense Gambles oak, maples and other deciduous trees and thick underbrush. It took a lot of beating around, zig-zagging back and forth, looking for roadways over which logs would have been dragged by oxen or mules to where the slide began. I finally started finding some cleared areas, and then found a pipe you see below. But, as one can see it is a modern galvanized pipe, with a cap that seems to be aluminum, so wasn’t from the pioneer period. Above you can see the size by comparing to my SPOT Tracker….which by the way I consider an essential technical and survival tool for explorers and backpackers. The pipe is about 2-1/2 inches in diameter and has no markings except a sort of cross on the cap as you can see. 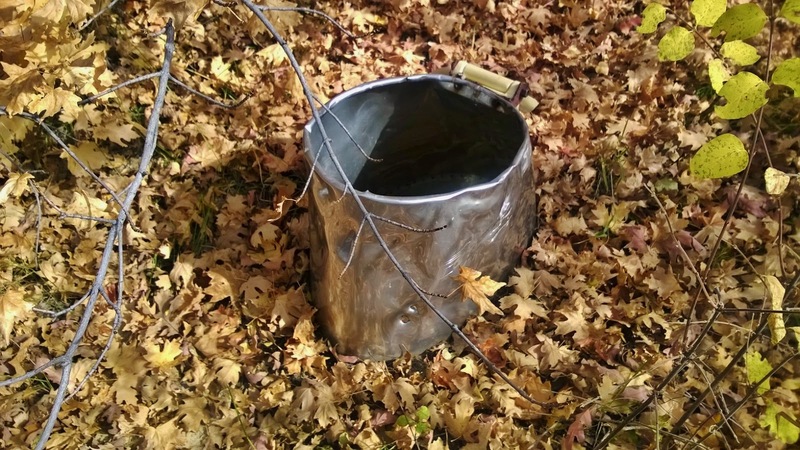 A little past the highest point on this hill, I found this aluminum toilet or latrine seat. Once again, not from the pioneer period. 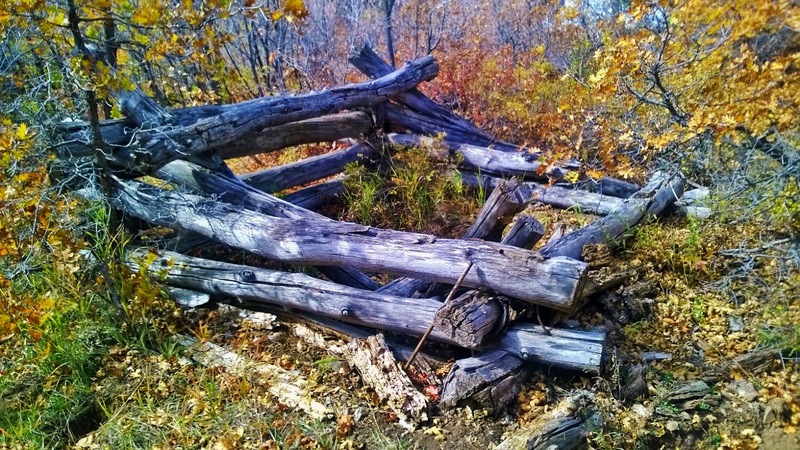 A little further to the northwest we found ruins of a cabin which in the first moment or two had my heart pounding…. In dating tie hacker ruins on the North Slope of the Uintas, you look for a number of factors, but a deciding one is NAILS. 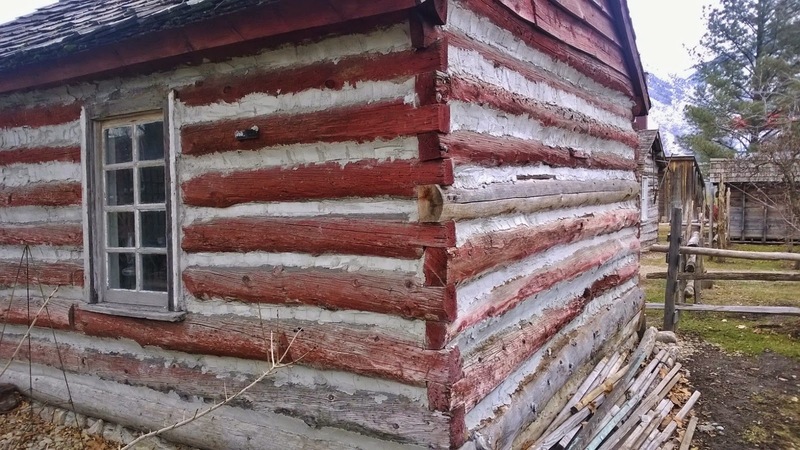 This cabin had been put together by very large round nails which dated the ruin as being after 1910 and not of the pioneer period. 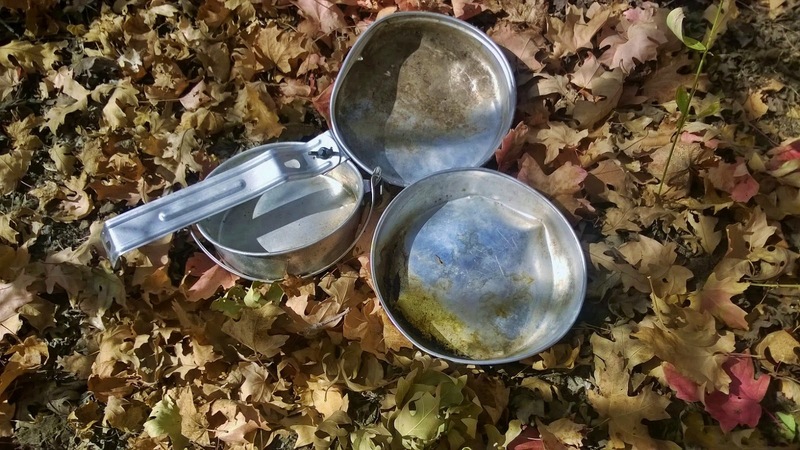 Further along I found this mess kit….likely from Boy Scouts, and not pioneers. There were large clearings and piles of branches and debri….but once again seemingly from modern times. 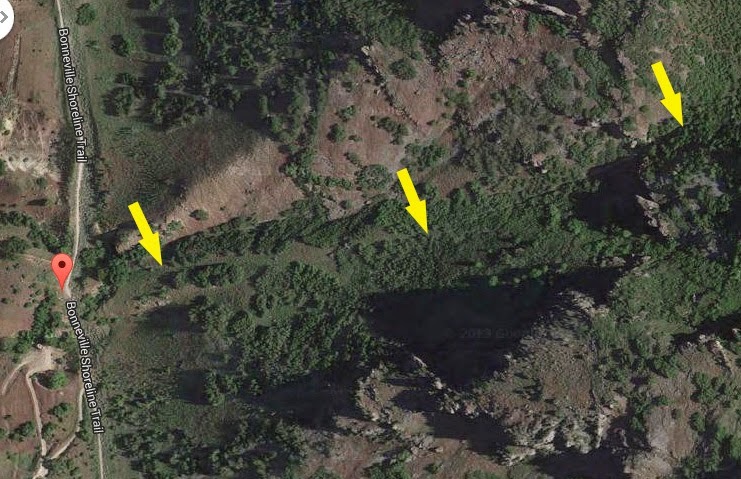 One of the clearings led to the edge of the mountain where it dropped off steeply into Slide Canyon. There were stumps here too, large ones, but all cut with a chain saw. Out of all the stumps, there was no sign of the large trees that someone had fallen. How were they removed from the remote mountain? You can read about it at the following link: SEVEN PEAKS. NOTE: The “seven peaks” must have been: Cascade Mt., Squaw Peak, Provo Peak, Y-Mountain, Maple Mt., & the two Buckley peaks. 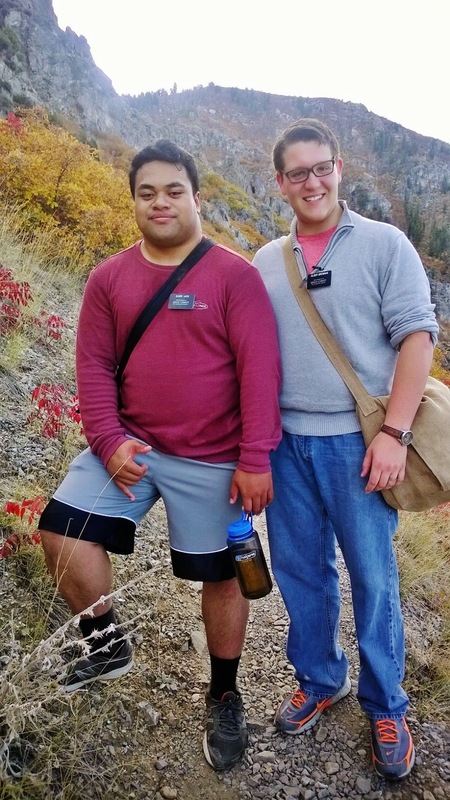 We finally came to the front edge of the mountain overlooking Provo. Ken is having a bit of lunch where we found two old pipes you see below, that we called “anchor pipes,” believing that we had found the launch site for the timber slide. 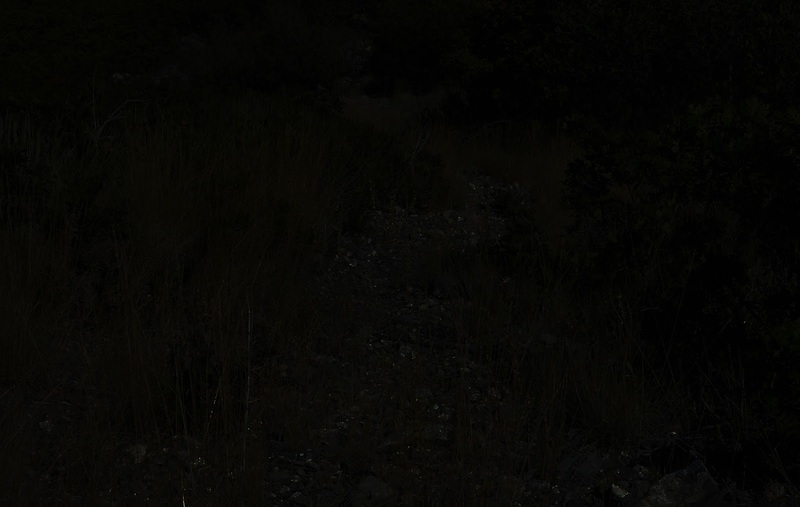 He then decided to head back as he didn’t want to get caught by nightfall on the mountain. Looking down on Provo, the anchor pipes aligning perfectly with 500 North St. Looking north from that spot towards Y Mountain. 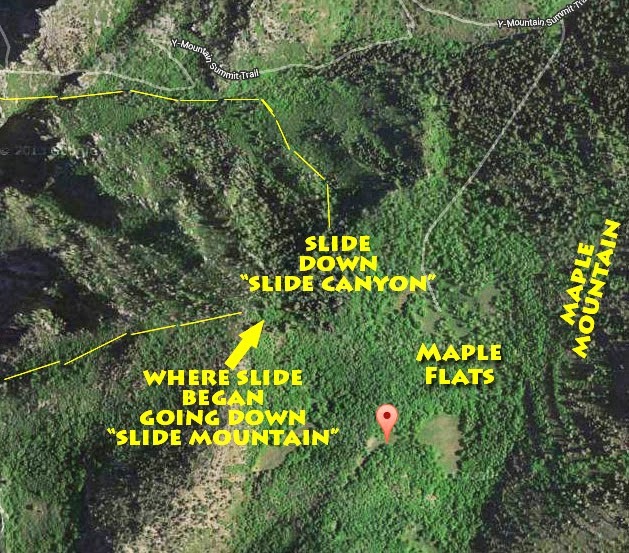 Above we see a sketch of more or less how the two timber slides came off of Slide Mountain. I hiked down that ridge towards the southeast to make sure I wasn’t missing anything. A 100 yards or so down I found this galvanized pipe with a reducer on the top. Once again something modern. I checked my print-outs to help orient myself, but as it worked out I didn’t pay close enough attention to details…….as we’ll see in a moment. Down the ridge a ways I decided I was wasting my time and snapped a shot looking south over Slate Canyon at Buckley Mountain. And, another shot at Maple Mountain to the east. Looking again at my print-outs I concluded that the launch site was up this ridge and concluded as previously with Ken, that the anchor pipes area was the launch site. So up the ridge I went, back to the anchor pipes. 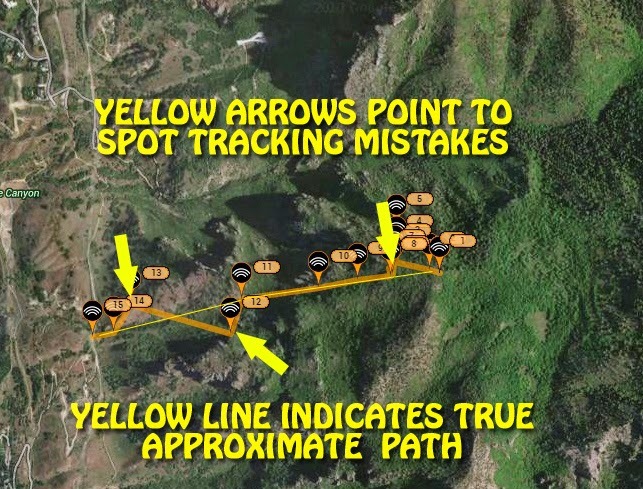 They certainly seemed to align with where the slide path went down the front of the mountain. I decided that I had time to follow the pathway down to Provo, rather than following the trail, that seemed to be the long way home! Once again learning that our logic doesn’t always work out to be the truth. This was the thinking, but shortly we’ll see how flawed our thinking can be by not focusing closely on details. SO I LAUNCHED MYSELF DOWN….WAY DOWN…. TOWARDS PROVO! 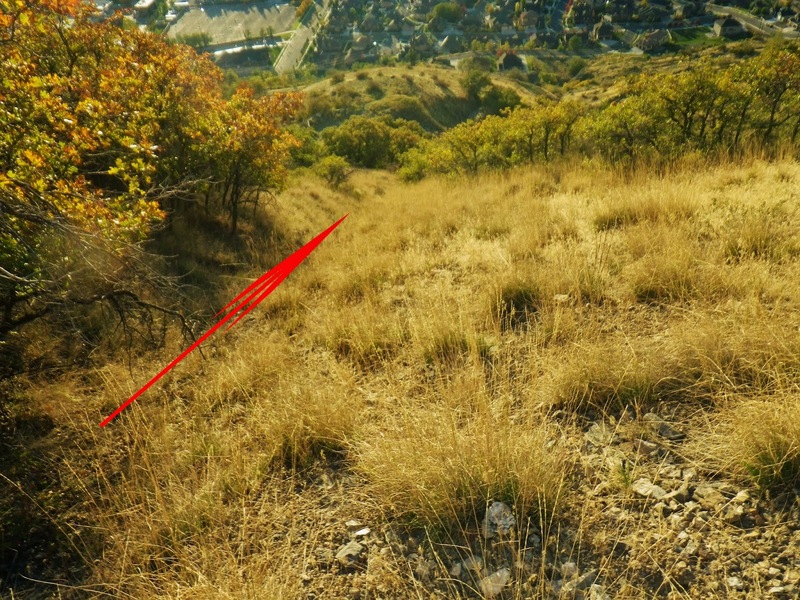 I had already found down the hill 10 meters another similar pipe following the exact same trajectory, so was convinced I was doing the right thing. I took photos of the unique, relatively old pipe with very large interior threads. Nearby I found this debri, which would say something to the person who knew. As seen below, while I went down I photographed to the northeast, up the hill a bit and to my right. These dead trees could serve to orient me on Google Earth and from the Y-Eagle Pass Trail. Here from my path down I shot directly to the north at the side of Y Mountain. Above I am angling to the northwest with my camera. Looking closely you can see to the right a sliver of the Y. Below I came to a clear area, but I couldn’t really find the slide pathway. Following carefully that same line I all of a sudden found myself in a jungle of Gambles oak and Maples, and it got pretty rough. Maybe you’ve heard that old people have thin skin, and for sure I’ve been accused of being “thin skinned” in the other sense too! With my thin skin I have scars all over my arms from the last 20 years of adventures. I soon got out my fisherman’s gloves, as I had come with all the essential survival stuff. As I proceeded down without finding the pathway, I sometimes got myself into tight spots running into steep drop-offs and cliffs, and lost time backtracking to get around them safely. The sun was dipping low in the western sky and it was beginning to darken some and it didn’t look good! Something had gone wrong and I was losing precious time. I was having a difficult time, even with some light still….and the night would be with no moon! What had gone wrong? I was following track (6) starting at the anchor pipes. If I had of looked more closely, and taken seriously those dead conifers on the edge of the mountain, I could have got straightened out, but it was too late. Track (7) was the correct path. Track (6) was wrong, got me into difficult parts of the mountain forcing me to get even farther off track and into time destroying tangles! All of that now seems to me a great metaphor for life….we’ve got to understand correctly the starting point and get on the right path or we can get off course into all kinds of time and even life “destroying tangles! 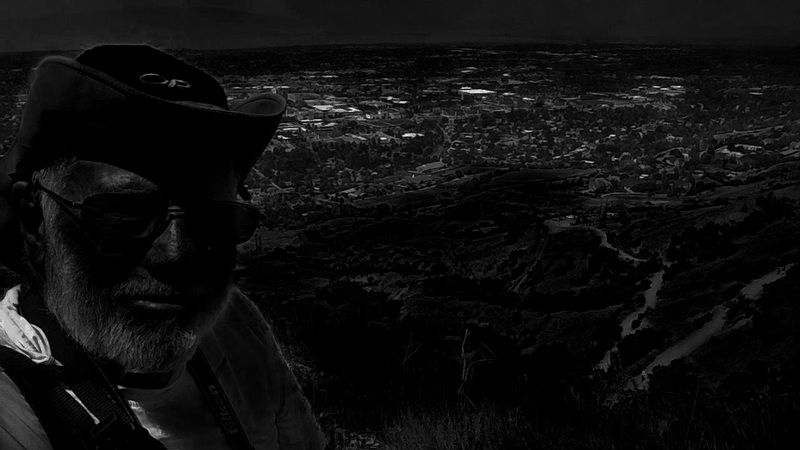 Darkness was almost upon me and I was only halfway down the mountain! Time to PANIC? Remember “panic” is a very frequent killer! 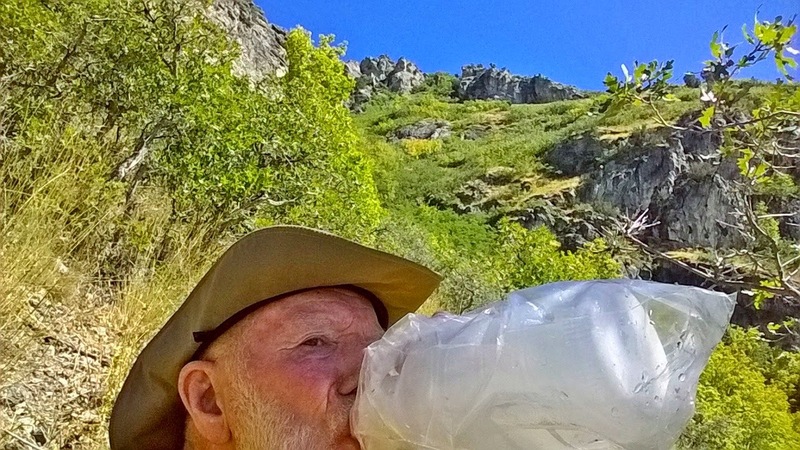 Later I will do a survival post outlining the principles that saved me, and can save almost anyone who gets into trouble along the Wasatch Front, or whatever wilderness. A plane flew by close….and….should I jump up and down waving my arms and screaming for help? By then I was totally fatigued and my legs trembled as I carefully climbed up at times to get around something, or went down shakily seeking for secure footholds. 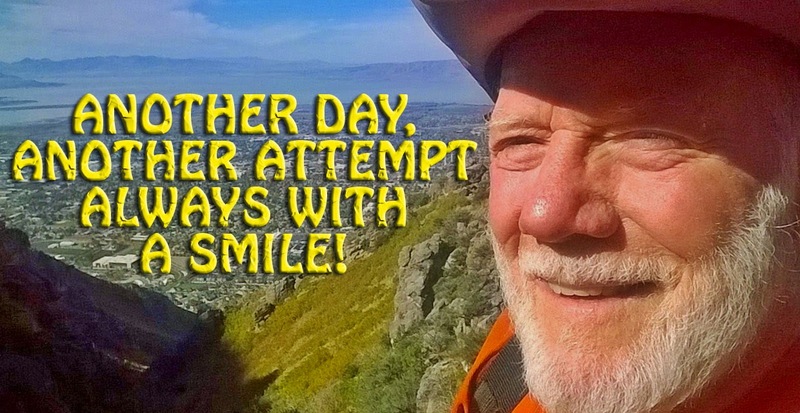 I didn’t think I had time, yet I had to avoid missteps, and so sat down at times for a few minutes of rest and calming prayer….and of course got into my backpack for some energy food and a drink, and especially for my headlamp into which I had inserted fresch batteries before leaving! I had weather-proof matches too, and my tiny bag of fail-proof fire starter from the Uintas. 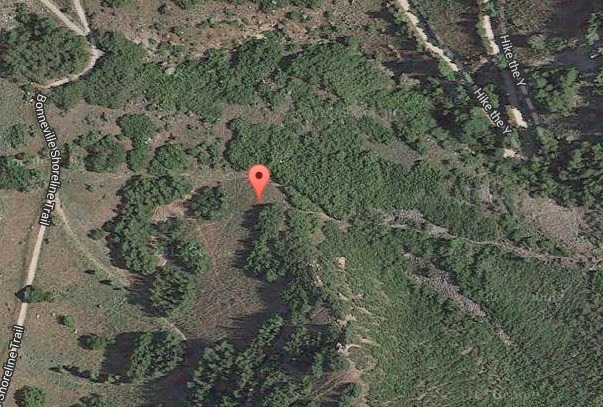 If I had to I could hole up somewhere and get a good fire going…..and use my cell phone to call home so nobody would worry and do anything stupid (in the Uintas or similar wilderness, it would have been a satellite phone). In fact I had all the time in the world…..all night and the next day if needed, so no need to panic, and no hurrying that could cause a miss-step. On this steep mountain I many times remembered rule #1 on such a mountain to “always lean into the mountain” rather than going the other way and tumble out of control down the mountain to a tragic end! Of course leaning into the mountain had me often times sliding downward on my rear end! By about 10:30 I made it to the foothill road and soon was at my car. Yes I was bloodied up some…but so what? And, my pants? Good thing I had on some tough old Levis from Deseret Industries, rather than my thin skinned convertible mountain backpacking pants! The 1st-from 2001 were ripped to pieces by gangbangers on Guatemala City’s main street who were trying to get at the money in my pockets…by the way I lost some pants, but WON THE WAR! Then the 2nd-from 2007 “trophy pants” came from a delirious and totally nutty me because of a mixture of narcotics after my ankle reconstruction in 2007, when I ripped up my suit pants trying to get them on over my cast at 11:00 PM on a Thursday night to go to Sunday Church!! This “SYNDROME” seems to repeat about every 7 years…..so I’ve got to watch out for 2021 in my 86th year! ..AND WITH A NEW PAIR OF DESERET INDUSTRIES LEVIS! I was up the mountain again on October 20th. This time I studied my previous attempts and the SPOT Tracks and knew where I had gone wrong and exactly where I had to go. The red SPOT icon where the anchor pipes were WASN’T THE LAUNCH SITE. I’m not sure what it was. 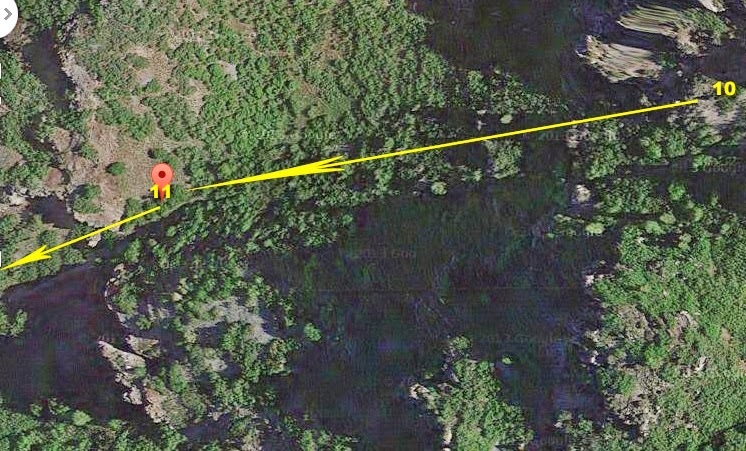 Remember, this flat looking Google Earth view shows a very steep slope DOWN! From the anchor pipes I had to go over to the very edge of the canyon and follow the line of dead conifers. Follow them down and you’ll see vaguely a half-moon path with the slide path taking off down the mountain from the middle point. Below it is enlarged and roughly penciled in with blue. In the middle of the half-moon is one dead conifer. Once there I was home free! Yes, it was Jeannie, one of my 400 customers from REAMS Supermarket in Springville, whose names I memorized, associating with each something to remember them, and I had a wonderful chat with Jeannie and hope she sees this and sends me her picture in her running clothes so I can insert it here. I can kick myself for not taking her picture then! Sometimes in this life the “long, slow, uphill, winding path” gives us the wonderful experiences–good and bad, that make it all an incredibly worthwhile journey! 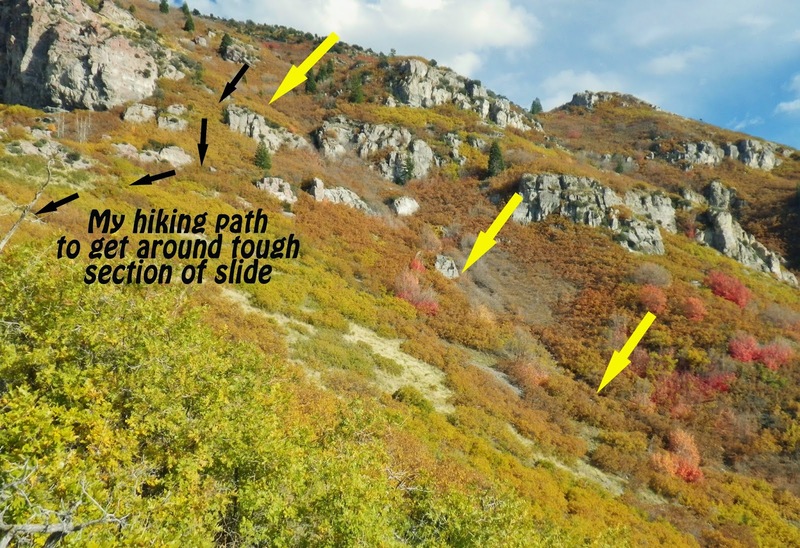 Yes, those dead confers up along the edge of Slide Mountain would be my guide! So I got up there and from the anchor pipes worked over towards the edge, and found and SPOT marked another modern pipe you see below. I’d appreciate it if someone out there can email me and tell me what such pipes might mean. I’m now over along the edge following the dead conifers, and getting a glimpse of the Y. Now I’ve worked down to that one lone dead tree seen above and below, and I’m right in the eye of the half-moon, and hit my SPOT Tracker. It’s sort of vague, but the picture below shows the portion of the half-moon that goes north marked by the red arrow. Below you see more clearly without the arrow. Here is the other half the goes south, above with the arrow, and below clear. In the middle the slide path takes off down towards Provo. 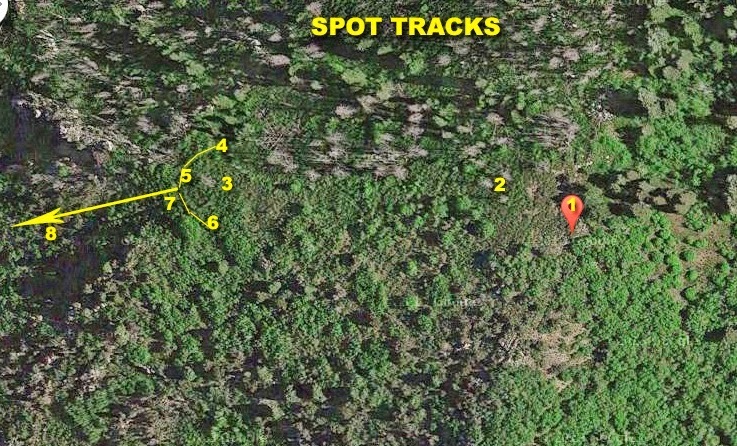 Above are the SPOT Tracks: (1) The “anchor pipes” at the red SPOT icon; (2) White caped modern pipe; (3) Lone pine; (4) north end of half-moon; (5) & (7) Pathway take-off point; (6) South end of half-moon; (8) Down the path. Here we go down the pathway. Here I moved off a bit to rest and have a bite to eat. I had my gloves on, but still got bloodied up some. Down we go! Provo still a long ways down. There were still some tough places! I still can’t quite imagine how they could have actually built a “… slide consisted[ing] of small logs on the bottom and large logs on each side, making a sort of trough” down through these areas. The description previously cited, saying, “Large logs as well as small ans [ones] would run with great rapidity….We would often start timbers at the top end of the slide an[d] it would run the entire [way to the] loading place with out a stop.” That description seems more likely to refer to the slide on the face of Slide Mountain. …... still lots of questions,. 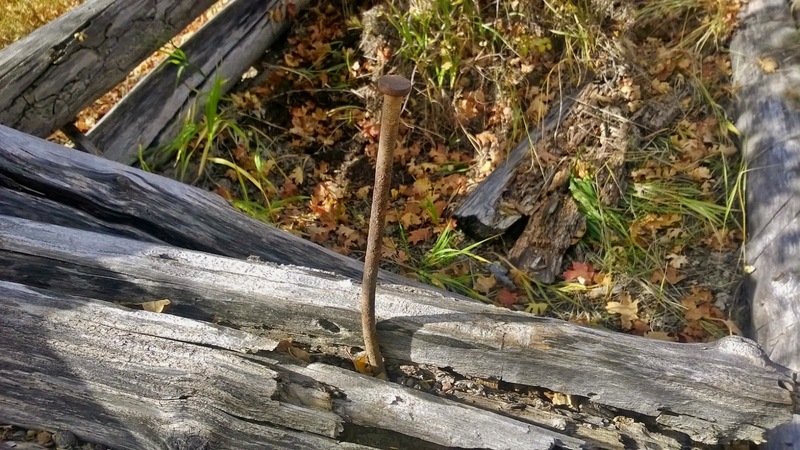 I had seen this coming out of the middle of the pathway on the survival hike down, but from far off to the side, and had hoped that it would be something significant, but it just worked out to be a steel fence post, not from pioneer times. What it was doing there, who knows. I saw another coming down the mountain away from the pathway. The disappointing aspect of this is that in all my hikes I have never found any artifacts, i.e. pieces of the chute, square nails, etc. 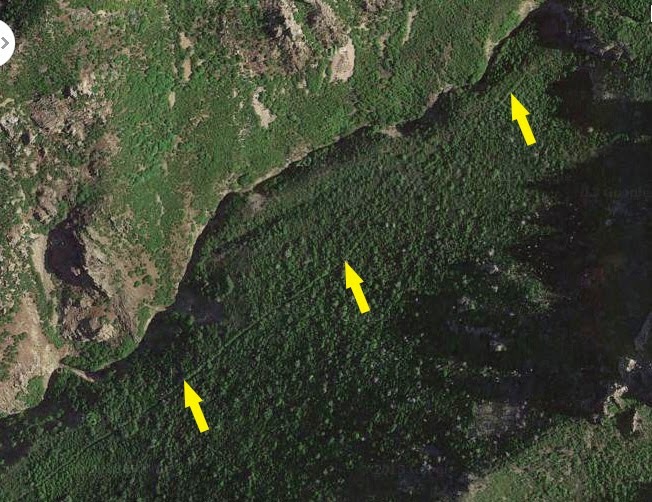 I know concerning the Hilliard Flume coming out of the Uintas and going 36 miles down into Wyoming, that once it fell into disuse, it was cannibalized and the reports on it say nothing is left. But, as you will notice in some of my reports, I have found remnants, support structures, support braces, square nails, etc. 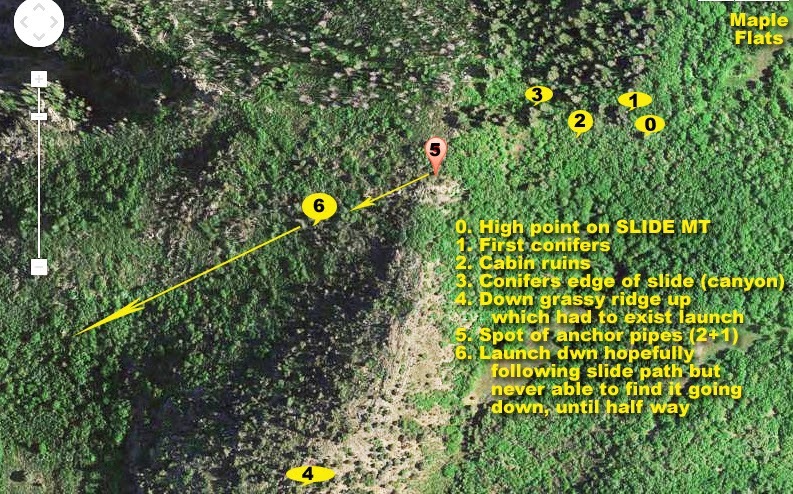 Here it was described as a “chute” built with “… small logs on the bottom and large logs on each side, making a sort of trough” and I was hoping to find something in these slide pathways, launching sites, etc. but have come up with nothing. To cannibalize these chutes and take everything down to Provo would have been almost as hard a task as getting them up here and building the timber slide. So there’s a lot we need to understand…… somehow. There are still some tough places ahead, but this time I had time on my side and so worked away at it carefully. Below we see the pathway from way off to the side as I had to work around some cliffs. I’ll insert some arrows pointing to the path. Here’s another area where to get around a very rough area with big drop-offs, I had to climb up and then down through thick oak and maples to finally get back to the path further down. The next picture will have arrows pointing to the slide and my separate path through a hard area. We are now approaching what I called in the report on exploring the lower portion, THE NARROWS. Once again my thin skin sort of created a little color for the report! 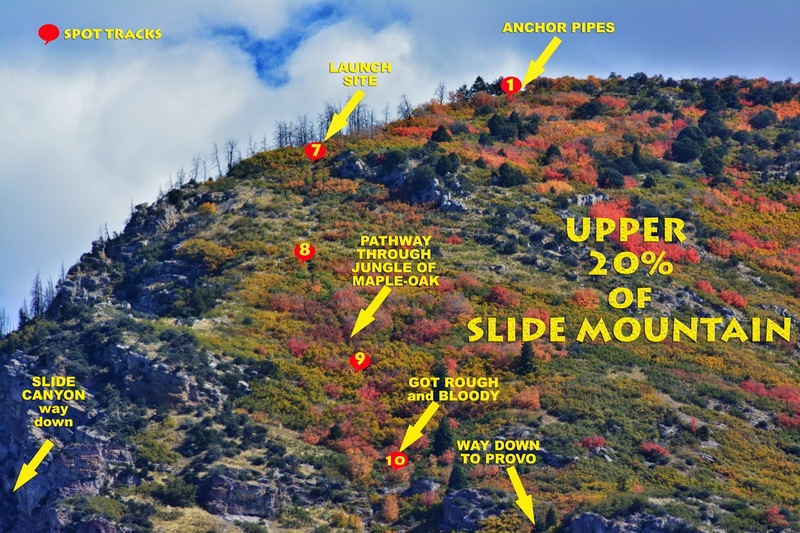 “Large logs as well as small ans [ones] would run with great rapidity….We would often start timbers at the top end of the slide an[d] it would run the entire [way to the] loading place with out a stop.” That description seems likely to refer to the slide on the face of Slide Mountain we are seeing here. A log to go down at a 45 degree angle all the way to the bottom without stopping could certainly qualify as being “whisk[ed]” down the mountain….at incredible speeds! Concerning the Hilliard Flume in the High UIntas the Forest Service described it a “WILD RIDE” with water carrying wood products down into Wyoming at 15 miles/hour. 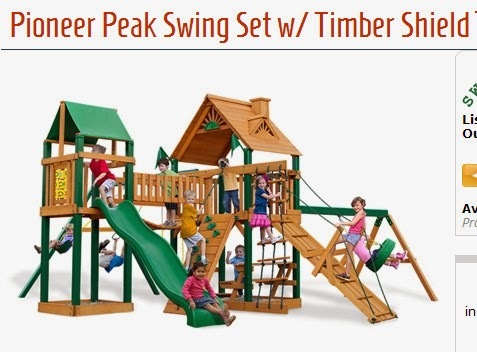 That journey couldn’t even come close to what this WILD timber slide ride was like! We are now in familiar territory approaching the area described in Carter’s book, FROM FOR TO VILLAGE, where the “…laborers dug a ditch down the mountainside,” to form a kind of trough which is what we see below in the lower portion of the pathway. Below we are entering that area, even though it is not so obvious as in the above photograph. 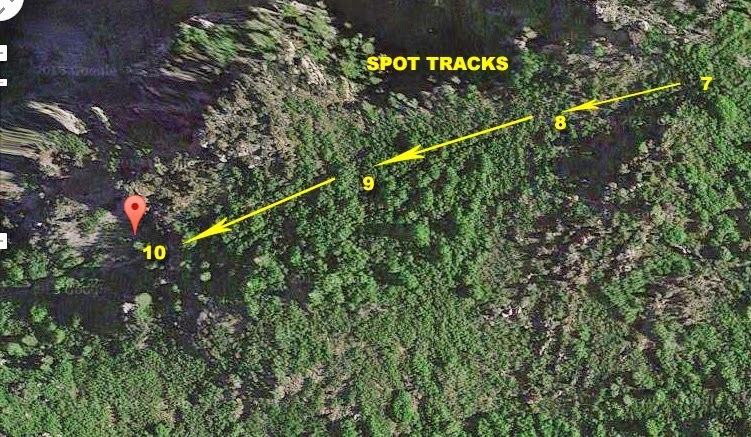 Above are the SPOT Tracks from the website showing my trip down the slide, but apparently the SPOT Tracker was off some in about three places making the pathway look pretty jagged, with a bit of correction made below the way it should have recorded it. 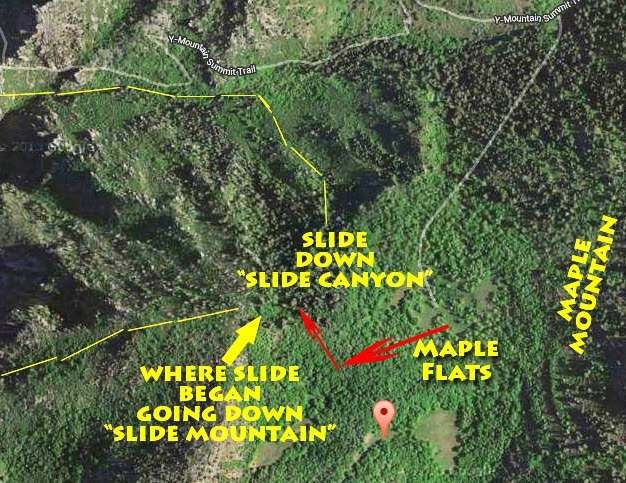 So I have confirmed the pathways of the three slides in the Provo-Springville area of Utah Valley, showing once again that our pioneer ancestors did some incredible feats that boggle my mind, and make them real UNSUNG HEROES, just as was the case with the tie hackers on the High Uintas North Slope–which story I tell on my website with 14 photo/essays and YouTube videos. 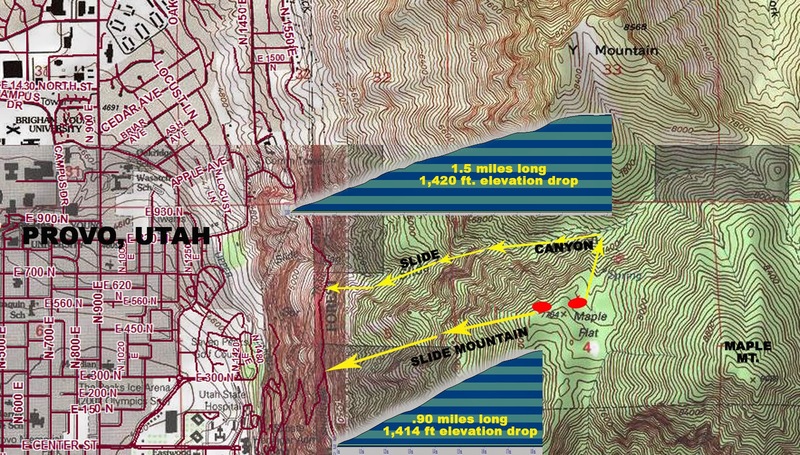 Below I insert a topo map of the two Provo slides, with elevation and distance profiles. 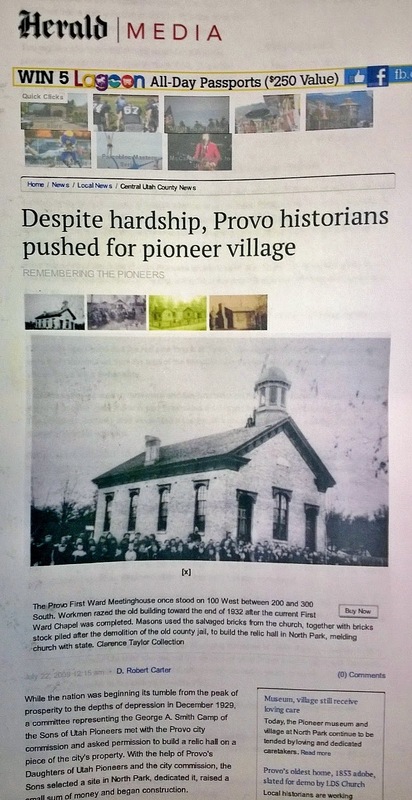 Provo and Springville might not have been built…at least not as quickly and easily! Special thanks to D. Robert Carter, of Springville, for his wonderful contributions to our historical knowledge with his two wonderful books about Provo, with a third coming out soon. 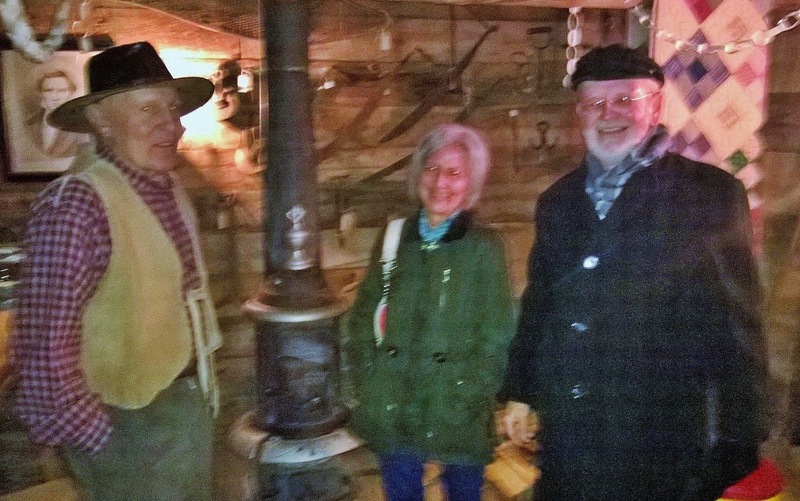 We see Mr. Carter below to the right at the Celtic Christmas held at the Pioneer Park. With him are friends Jon Clark, and Laura…..sorry about the quality of my smart phone camera.